That’s the most important requirement for making a good wine. This seminar and tasting by our own Annette Schiller will emphasize the utter importance of ‘location’, i.e. 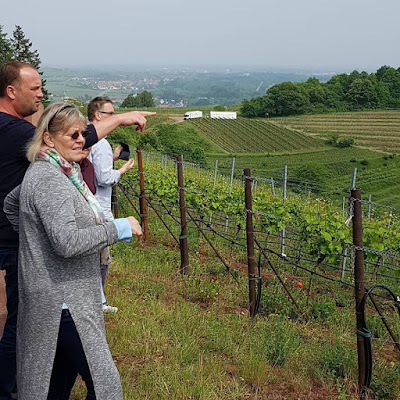 terroir, in the German wine landscape. Before the 1970s German vineyard maps showed 35,000 single vineyard sites. These maps go back to the mid -1800s when the Prussian Government did extensive research on soil compositions and geological formations in the vineyards. The oldest wine classification map of the world is that of the Rheingau, by Friedrich Wilhelm Dunkelberg in 1867. The philosophy behind producing top quality wines was clearly terroir driven: good soils plus a good microclimate made for good fruit, and hence good wines. From the late 19th century until shortly before WW II wines of specific German vineyards, such as Erbacher Marcobrunn, were the most expensive wines world-wide. Prices were higher than for wines from the most expensive Bordeaux first growth châteaux and a Romanée Conti. The wine law of 1971 abolished the traditional, historic terroir thinking, merged vineyard sites, and reduced the number of single vineyards to 5,000. With a more sophisticated, very educated vintner generation, the idea to produce top quality wines and to bring German wines back into the first row took hold. It was in the late 1980s when the movement to return to history started and the focus shifted to the vineyard sites. Beginning in 2002 the VDP (Association of Premium German Wine Estates) worked to introduce a terroir-driven classification based on historic vineyard maps modeled after the Burgundy classification. Annette will present 12 wines – and an additional very special one – to showcase the philosophy of terroir-driven wine making in Germany. 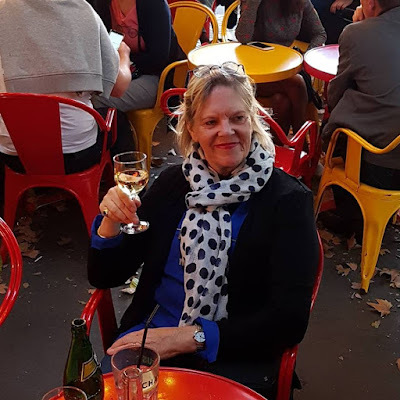 Annette Schiller is well known to the GWS community through previous wine tastings and her ombiasy wine tours to Bordeaux, Burgundy, Rhône, and Germany. She has visited all of the estates she will present on personal occasions or on one of her tours and has intimate knowledge of these producers and the wines. DATE: Friday, January 18th, 2019. Doors open at 7:00 pm; tasting begins at 7:30 pm. Please make reservations by January 15, 2019. VENUE: Harbour Square Club Room, 500 N St SW, Washington, DC. Marilyn Scarbrough has reserved a few parking spaces, but we cannot guarantee these will be available. The Waterfront Metro Station (Green Line) is nearby. COST: $40 for members, $47 for non-members. We started in vibrant, cool, sophisticated Lyon, the capital of Haut Cuisine. 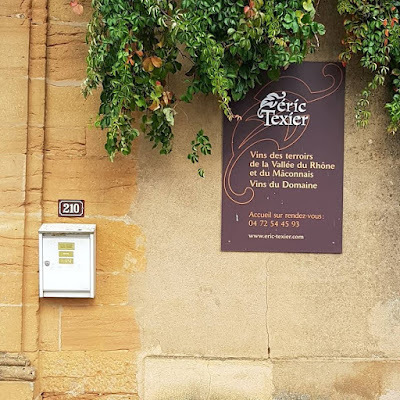 On our first day in Lyon we travelled a couple of miles north of Lyon to visit the domaine of Eric Texier, who is one of the dynamic winemakers in the Rhône valley, although his domaine is located in the very southern tip of the Beaujolais region. The next two days we spent in the Northern Rhône area visiting domaines in the Côte Rôtie, Condrieu, Hermitage and Crozes-Hermitage. We then travelled to Séguret, which lies picturesquely at the foot of the Dentelles de Montmirail, a mountain range visible from afar because of the dramatically jagged shape of their peaks. From here we explored domaines in Gigondas, Vacqueyras, Rasteau. The weekend, we spent in "real" Prvovençe at the foot of the famous village Les Baux de Provence. Here almost every wine domaine also produces olive oil. 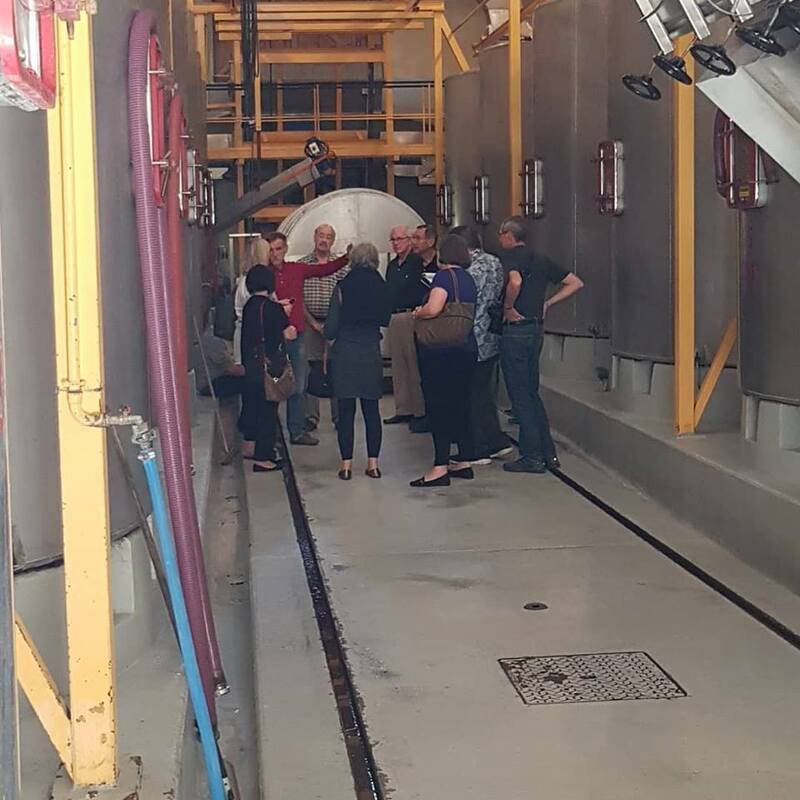 We visited a winery and olive oil production. The next two nights we spent in Avignon. 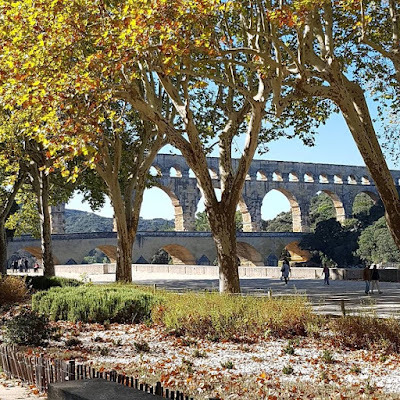 We traced the footsteps of van Gogh in Arles, we travel to the Pont du Gard to be amazed at what the Romans already achieved 2000 years ago, we visit the famous Papal Palace in Avignon as well as the famous Pont d'Avignon. The last day and night we explored Châteauneuf du Pape with visits and tasting of famous and not so famous wineries and the last evening we had a fabulous wine pairing dinner at the beautiful winery and hostellerie Château des Fines Roches on the outskirts of Châteauneuf du Pape. We visited a total of 21 domaines in well-known appellations such as Côte Rôtie, Crozes-Hermitage, Châteauneuf du Pape, Gigondas, Vacqueras, etc. 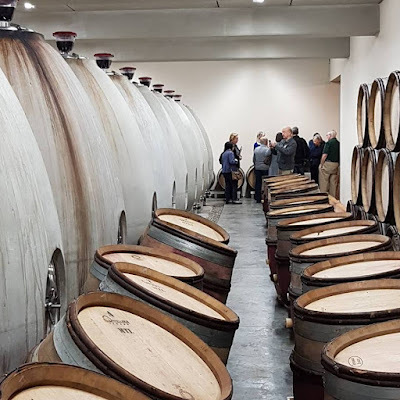 We got intimate insights into the world of the Rhône Valley wines with visits to famous domaines, but also to excellent lesser known and unknown producers. We saw the beautiful terraced vineyard sites clinging to the slopes of the steep mountains in the Northern Rhône. 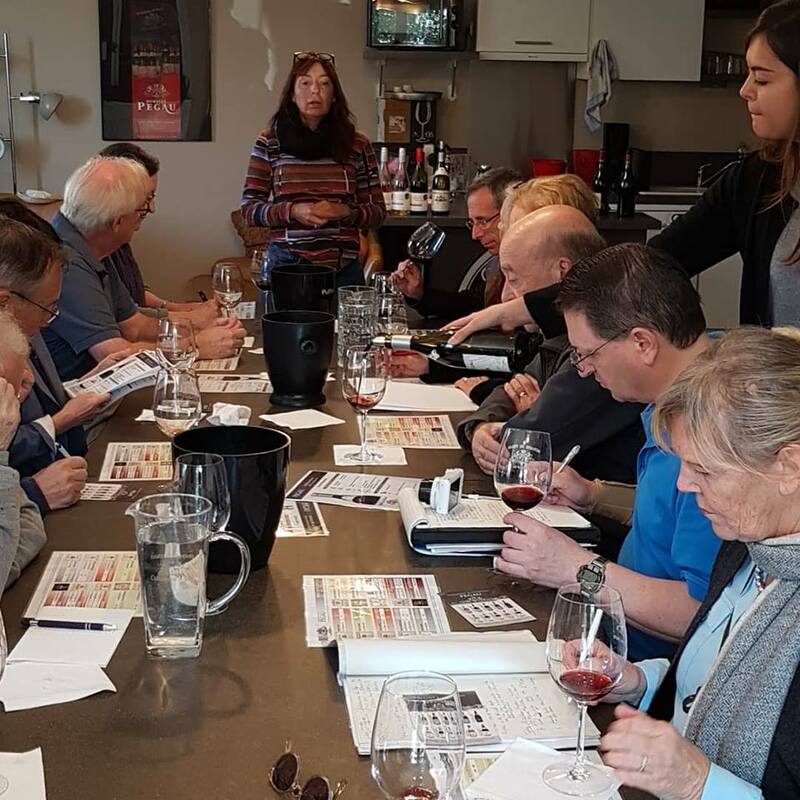 We explored the fascinating history of the region and its importance for wine production and wine trade. We visited an olive farm in the southernmost part of the Rhône valley wine region. We visited medieval villages and historic landmarks from Roman times. 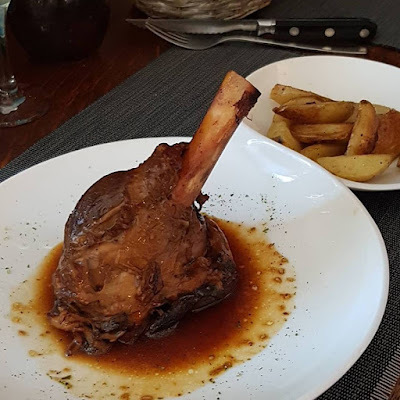 We had meals at beautiful, quaint French village restaurants typical for the region. We dined at a Michelin-starred restaurant. We travelled through incredibly beautiful landscapes, which have been made immortal by the paintings of the Impressionist artists. We did a guided tour of the Papal Palace in Avignon. 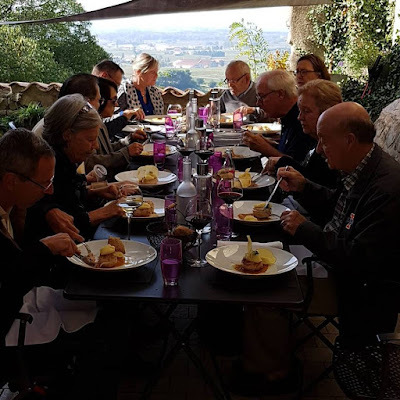 We experienced genuine French hospitality and the Provence "savoir-vivre". The Rhône Valley is one of the oldest wine regions in France, and the second largest after Bordeaux. The Greeks introduced viticulture in the 4th century BC. Later the Romans came and brought viticulture to a different level. Since then the world has discovered Rhône wines and some of the most famous wines come from the Rhône Valley. The vineyards are located on both sides of the river. The Rhône Valley is divided into two distinctively different regions: the Northern Rhône and the Southern Rhône. The Northern Rhône stretches for 60 miles from Vienne – south of Lyon – to Valence, and produces just 5% of Rhône wines. The region has a continental climate with pronounced seasons. The soils are granitic and schistous and the vineyards are located on very steep terraced slopes. The red grape of the Northern Rhône is 100% Syrah. Depending on the appellation the red wines are often blended with 5 – 20% of the white varietals Viognier, Marsanne, and Roussanne. As the Rhône river flows southward and the valley widens the climate changes. It becomes more Mediterranean with long, warm summers and mild winters. 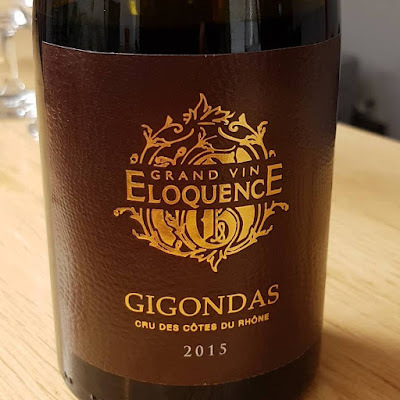 Here we find the big brother of the Northern Rhône, the Southern Rhône wine region which accounts for 95% of the production and with Grenache being the principal variety in most red wine blends. There also is Syrah, Mourvèdre, ( “GSM” blends) and a variety of other red and white grapes. The landscape is much flatter than in the north and a variety of soils can be found: alluvial soils, limestone subsoils, sand, gravel, stones. We will taste the entire range of Rhône wines: reds, whites, rosé, sweet, fortified wines. It is so difficult to choose which wine estate to visit since there are many great producers. 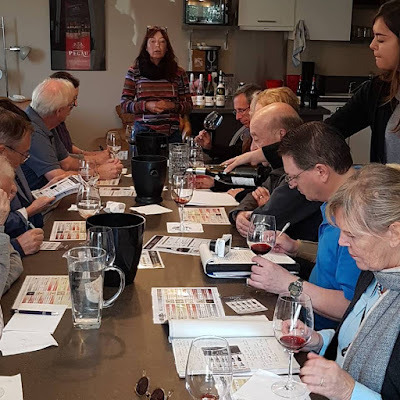 We selected top estates of different price points, from top-rated well-known expensive wines to budget friendly, excellent, unknown wines of small producers. 08:00 pm Dinner at Grand Café des Négociants. Some of us arrived a bit earlier. On Sunday evening four of us had dinner at the Grand Café des Négociants, which was created in 1864 and has kept until this day its beautiful Second Empire decor characterized by its moulded and painted ceilings, its splendid opulent curtains and its numerous mirrors, all in burgundy and mahogany monochrome. 02.00 pm Welcome coffee and introduction to the Rhône wine region at Grand Hôtel des Terreaux in Lyon. Just next to the hotel is the Broc Bar. 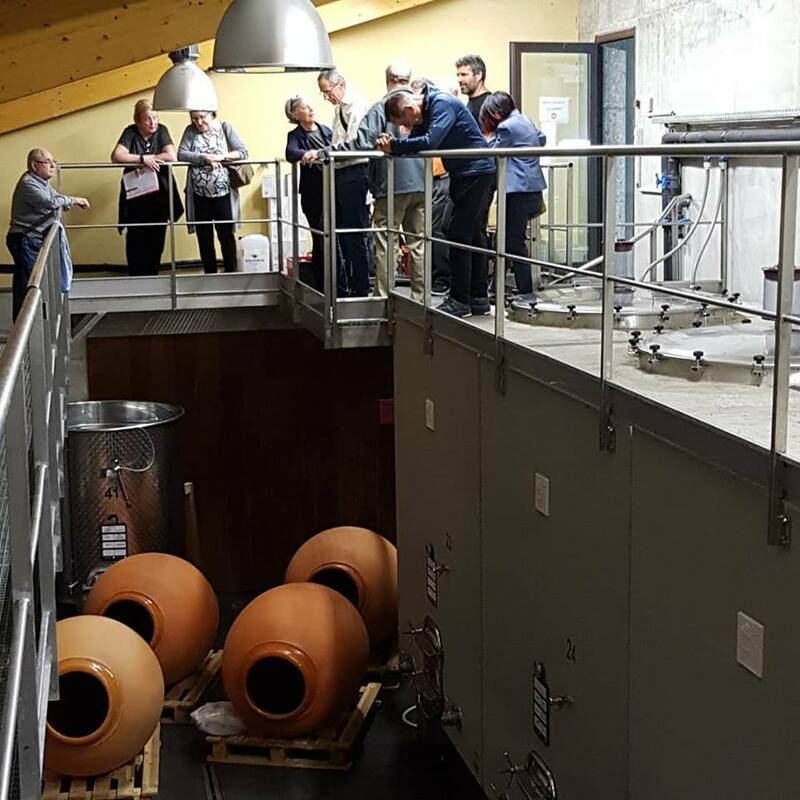 03.15 pm Cellar Tasting, including from Barrel, at Domaine Eric Texier in Charney, north of Lyon. Eric Texier's wife Laurence was our host. We started our journey through the Rhône Valley with a visit to one of the innovative and most dynamic winemaker of the “young and wild” Rhône Valley crowd: Eric Texier. He is a Bordeaux native and nuclear engineer by training. He fell in love with wine and looked for opportunities to buy vineyards in areas with top terroir. 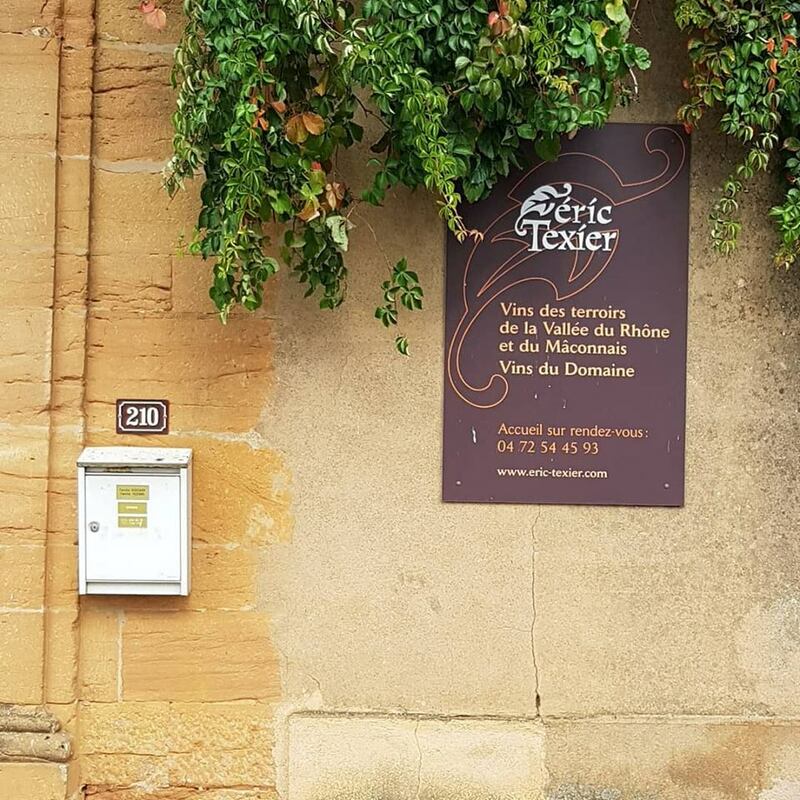 Eric farms biodynamically and now owns vineyards in Brézème and in Saint Julien en Saint Alban, both small appellations at the southern tip of the northern Rhône. Brézème is a once-celebrated but by then long-neglected vineyard area in a remote area on the eastern side of the Rhône River. The “Coteau” has full southern exposure, 300 meters in elevation, limestone-rich clay soils and an increasingly steep aspect with rockier terrain as the slope rises. Back in the mid 1800 hundreds, the wines of Brézème had rivalled those of Hermitage (20 miles to the north, also on the eastern side of the Rhône), in terms of reputation and price; it attained solo AOC status in the Côtes-du-Rhône zone back in 1943. But by 1961, Brézème and its ancient terraces of pre-clonal, old-variant Syrah known as Serine had largely been abandoned. Half of Eric’s plots of Syrah vines in Brézème and Saint Alban are still on their own roots. In Saint Alban Eric produces a Grenache which gives us the opportunity to taste a rare cool climate Grenache. 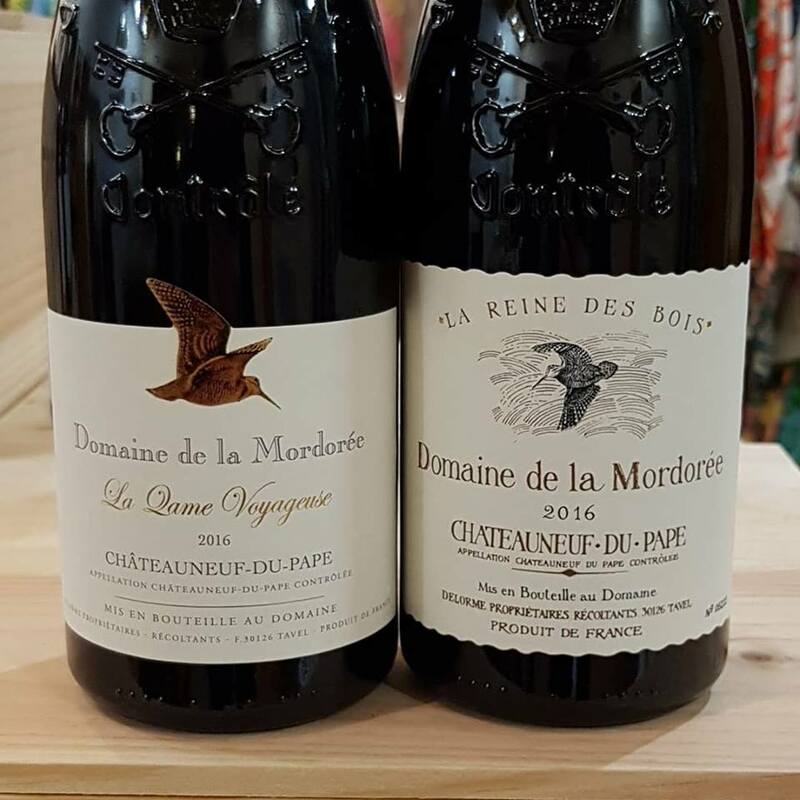 He also leases some plots (only of winemakers that obey to his settings of biodynamic work) in other Rhône areas including Châteauneuf du Pape. We got a very good, thorough, and extremely interesting introduction to the Rhône. 07.00 pm Traditional Dinner at Le Bouchon des Filles. A “buchon” only serves one traditional Lyonnais menu and very often the bowls are passed around for everyone to take what he likes. Le Bouchon des Filles is one of the highly regarded traditional Bouchons and has 11 point (out of 20 – 1 Michelin star places start with 14) in France’s Gault & Millau l’expert gourmand guide. On the way home, we came by one of Lyon's famous mural paintings.Lyon is not only known for its gastronomy, its secret passageways (traboules), the Roman theatre or its old streets. Lyon is also known as one of the cities in the world with the most number mural paintings (frescos). Most of them are really good, but one, the most famous one, is totally amazing. 09.00 am Departure from Lyon and short drive to the Côte Rôtie. 09.45 am Cellar tour and tasting at Maison Guigal in Ampuis, Côte Rôtie, Northern Rhône. 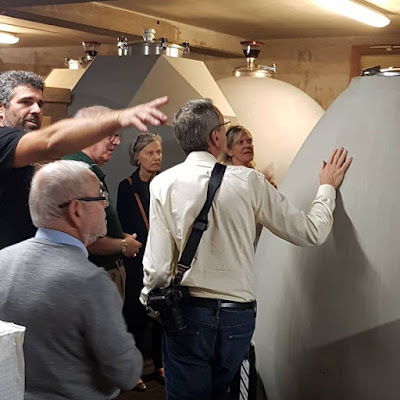 Export Director Stephane Crozet was our host.We were also greeted by the new technical director/ winemaker Jacques Desvernois. 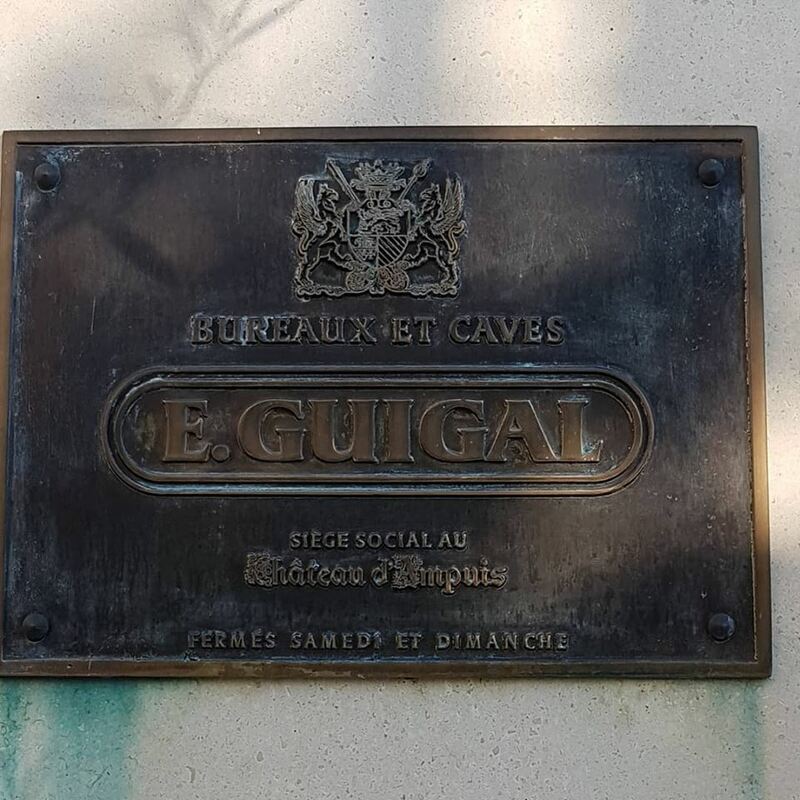 The Guigal Estate is a family business and was founded in 1946 by Etienne Guigal. Etienne Guigal worked at Vidal Fleury before establishing his own domaine. Much later in the 1980s Vidal Fleury was acquired by Guigal, but remains independently managed. Today Maison Guigal is run by Philippe Guigal, the third generation of the family who also is the head winemaker. 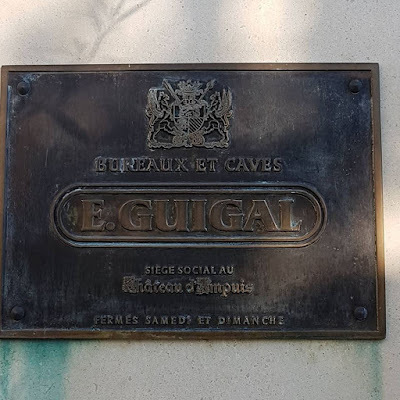 Through carefully selected acquisitions Guigal grew and today the total vineyard holdings is around 120 acres of which half of it is in the Côte Rôtie. 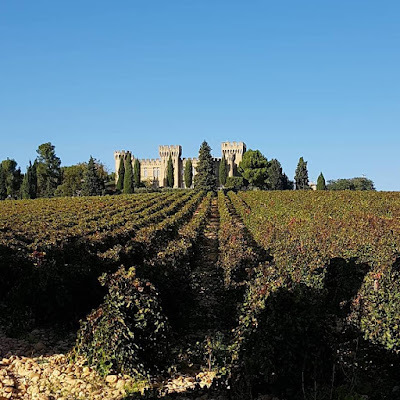 The estate also acquired the famous Château d’Ampuis, an important historic and oenological monument whose long history – an ancient fort built in the 12th century- is directly linked to the Côte-Rôtie appellation. The Château sits majestically on a hill surrounded by vineyards overlooking the Rhône river. With a current production of 6,5 million bottles Guigal is also the most important négociant in the Northern Rhône, although the majority of the purchased fruit comes from the Southern Rhône. 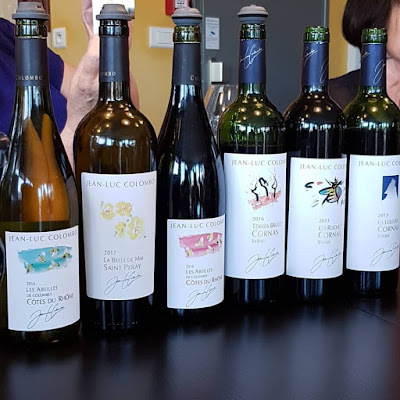 Marcel Guigal, the second generation is credited with the biggest impact on the quality of the Northern Rhône wines when he introduced single vineyard cuvées from Côte Rôtie in the 1970s. Maison Guigal has the rare distinction of being a quality leader in both estate and négociant wines. 11.45 am Drive through the beautifully situated vineyards of the Côte Rôtie (Côte Blonde and Côte Brune). 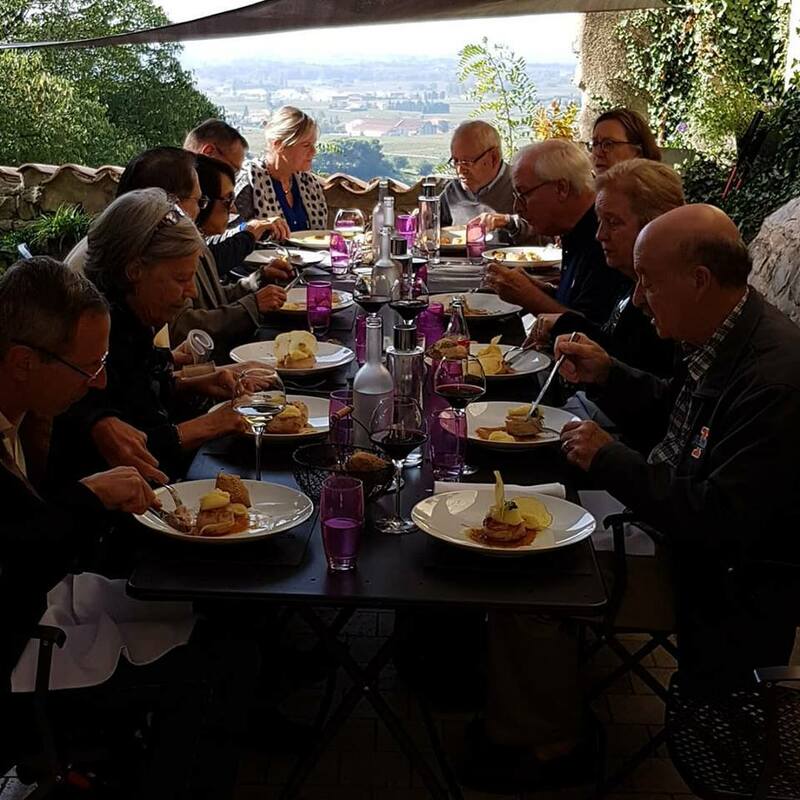 12.30 pm Lunch at Relais de Provence in Ampuis. This is a simple village lunch hang-out for locals and the occasional tourist alike. 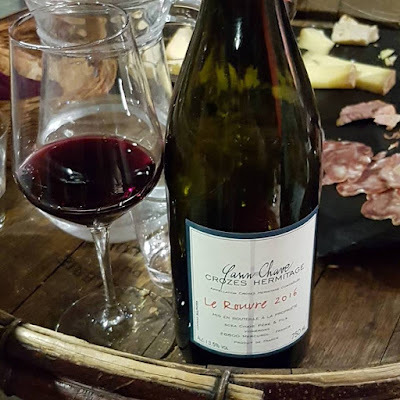 02.15 pm Tasting at Maison Clusel-Roche in Ampuis, Côte Rôtie, Northern Rhône. 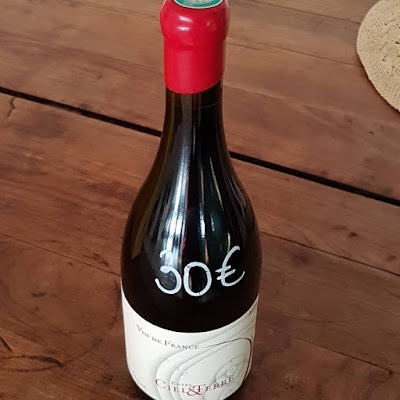 This is a very small family highly regarded winery with 20 acres of vineyards of which 12 acres are in the Côte Rôtie, 2,5 in Condrieu and 5,5 in the Coteaux du Lyonnais (a not well-known appellation between Lyon and Côte Rôtie where plantings are Gamay and the wine is similar to a Beaujolais). Currently the fourth generation, Guillaume Clusel is managing the estate together with his parents Gilbert Clusel and Brigitte Roch. 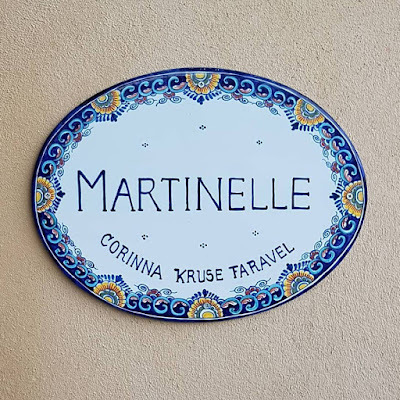 To best describe their philosophy of wine making I quote the family: „For as long as we can remember, farming has always been a part of our family history; in the past we specialized in vegetable growing and presently we are winegrowers. 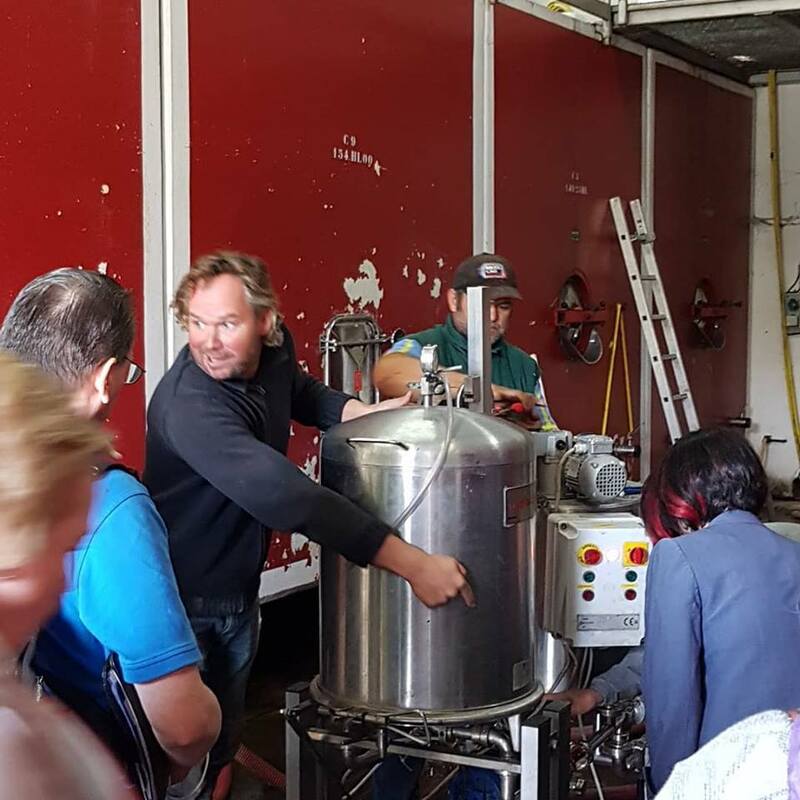 Today, we are both enthusiastic farmers and devoted winemakers. Our passion for the soil, the vines, good wine and good food, gives us the strength to keep our terroir alive and develop our family heritage. 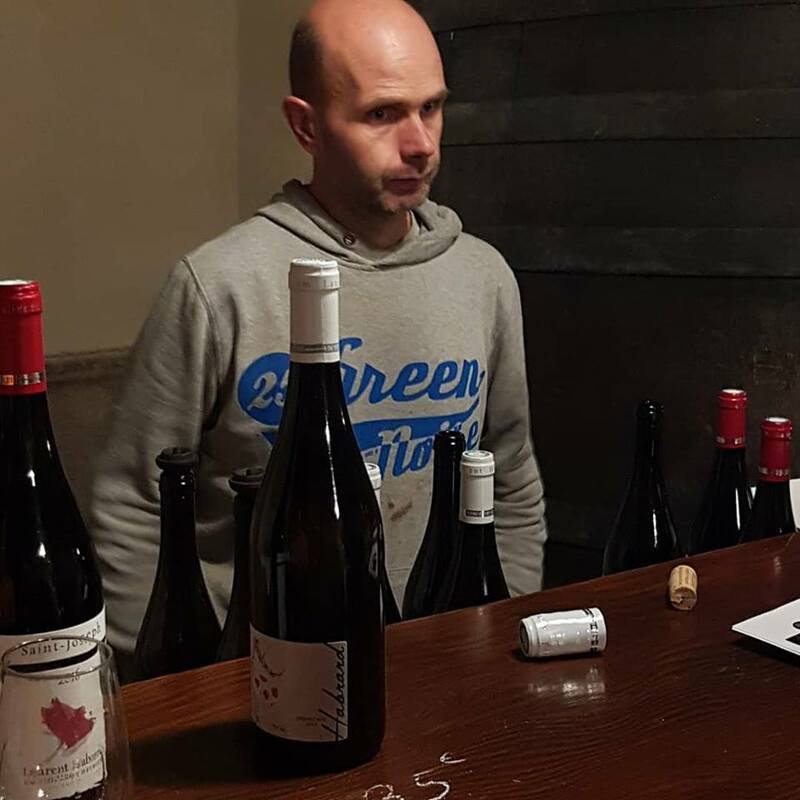 It leads us to grow and make wine in the most natural way possible, whether on the vertiginous slopes of the Côte Rôtie or on the gentle hillsides of the Coteaux du Lyonnais.” Since 2014 Guillaume also purchases some grapes from certified organic growers he has faith in to broaden his portfolio and to make up for some small vintages, thus converting the “Domaine” to a “Maison”. 04.15 pm Departure and short drive to Condrieu. 04.30 pm Tasting at Domaine Georges Vernay in Condrieu, Northern Rhône. Paul Ansellem-Vernay was our host. 06.30 pm Arrival and check-in at Hôtellerie Beau Rivage in Condrieu. 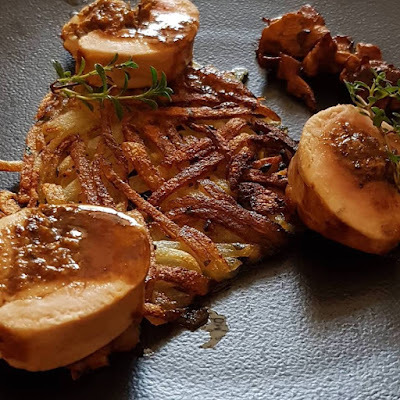 Hôtel Beau Rivage in Condrieu is an old school 4 star hotel with an exquisite restaurant sitting on the banks of the Rhône river with gorgeous views over the water and towards the Condrieu vineyards to the other side. 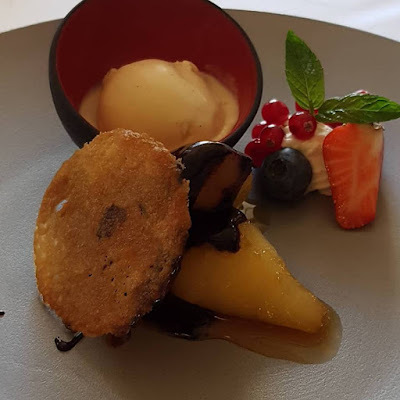 08.00 pm Gourmet Dinner with matching wines at Restaurant Beau Rivage in Condrieu. Chef Ludovic Mounier is well known beyond the boundaries of the Northern Rhône. This elegant restaurant features an innovative cuisine with classic top regional products. 10.30 am Cellar tour and tasting at Maison Delas-Frères in Saint Jean de Muzols – Saint Joseph, Northern Rhône. Bruno Gonnet was our host. Delas-Frères is one of the top producers of the Rhône in a myriad of appellations with holdings in the Côte Rôtie, Saint Joseph, Saint Péray, Hermitage, Crozes Hermitage, Cornas and Condrieu in the Northern Rhône as well as in the Southern Rhône in Châteauneuf du Pape. The company also produces one of the top value wines from the region with their Côte du Rhône. Delas-Frères can look back on one of the longest history in the region. It was founded in 1834 as a négociant house. In 1977 Delas-Frères was acquired by Champagne Deutz. When Deutz was purchased by Roederer in 1993 Delas-Frères came under the ownership of Champagne Roederer. About half of the production of 1,5 million bottles comes from the 75 acres of Domaine vineyards; the other half comes from purchased grapes. Many bottlings of the Domaine production are labeled as Domaine des Tourettes. 12.15 pm Lunch at restaurant La Grappe d’Or in Saint-Péray. 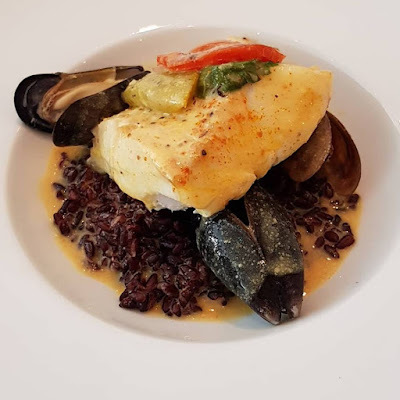 This is a small, unique restaurant that serves a delicious, excellently prepared lunch menu. 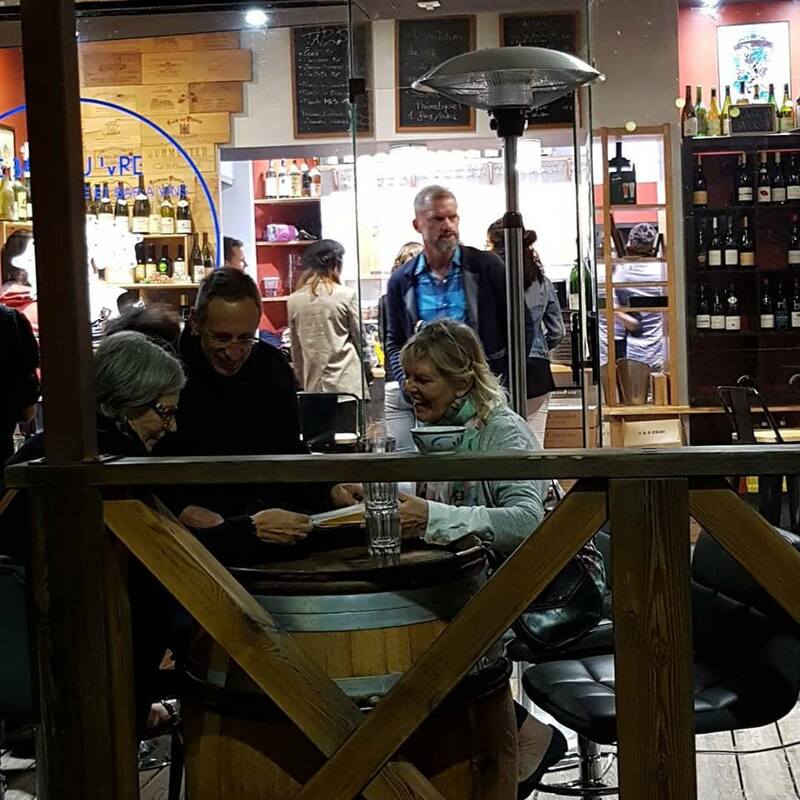 The wine menu is attractive with a great selection of local wines. 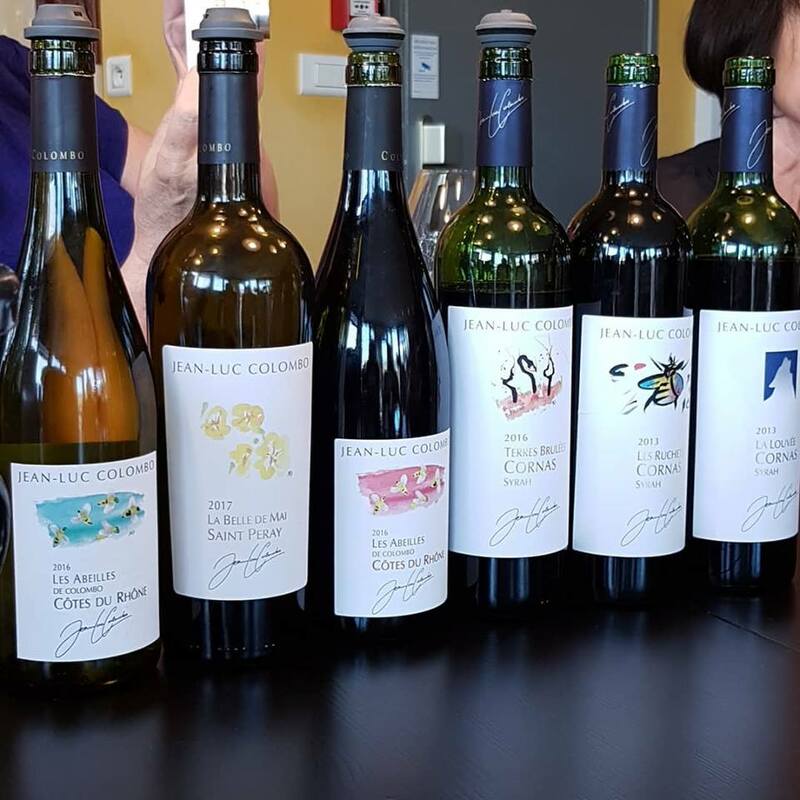 02.00 pm Tasting at Domaine Jean Luc Colombo in Cornas, Northern Rhône. Jean-Luc, a native of Marseille, moved with his wife Anne to Cornas in 1982 to set up a pharmacy and oenology lab. Both are oenologists and they created the “Centre of Oenology of Côtes du Rhône” in Cornas in 1984. 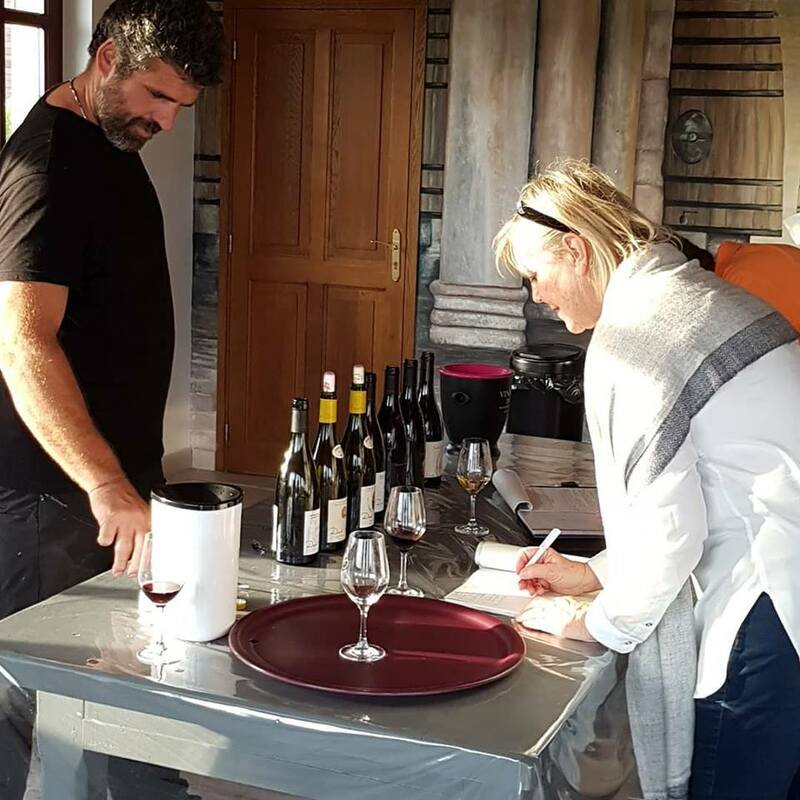 Jean-Luc has ever since been a consulting winemaker for some 100 of the best “Domaines” in the Rhône Valley, Provence and Bordeaux. In 1993 Anne and Jean-Luc sold the pharmacy to focus only on wine. They purchased more vineyards and started to work as négociants in the region. The Domaine now has 30 acres of vineyard holdings in Cornas. The bulk of the entire production is through the négociant business, with around 30 wines, the biggest line being the Côte de Rhône. 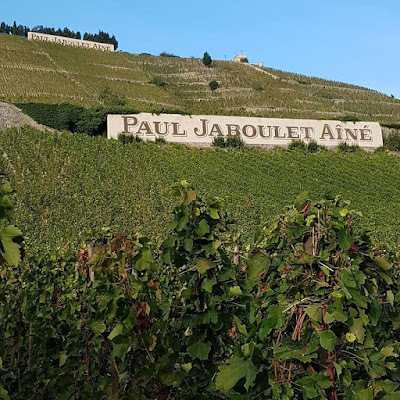 04.00 pm Vineyard walk and tasting at Paul Jaboulet Aîné in Tain-l’Hermitage. Hermitage, Northern Rhône. Paul Jaboulet Aîné is the smallest of the big négociants businesses of the Rhône region. Jaboulet is a great old name and one of the historic estates in the Rhône. 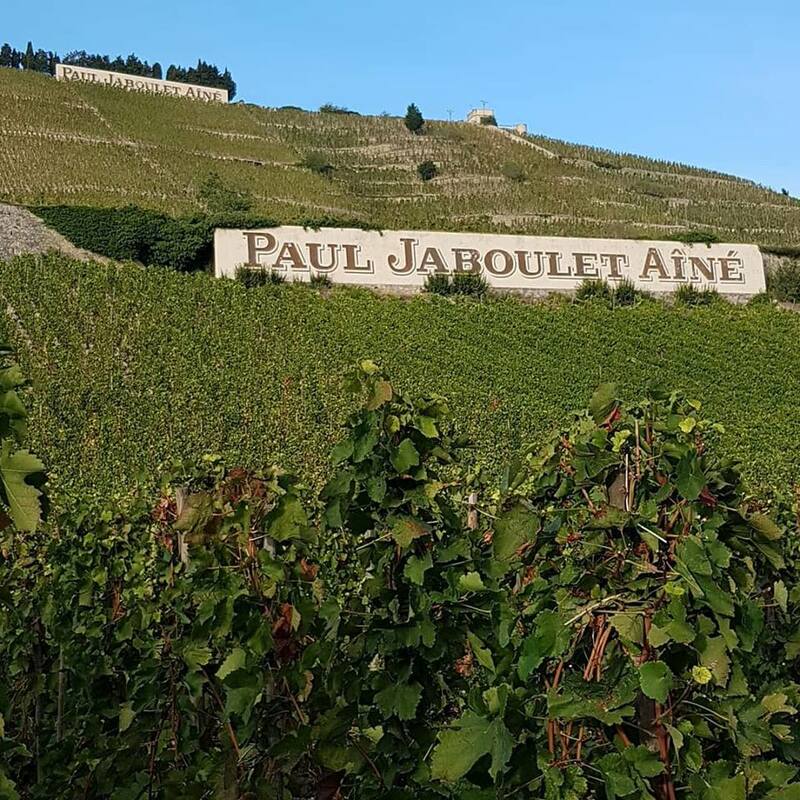 Exactly 100 years before the AOC system was established, in 1834 Antoine Jaboulet began to transform a sleepy region into one of the most important wine regions of the world and Jaboulet has since become a benchmark in the Northern Rhône. The iconic vineyard site “La Chapelle” visible from afar because of the chapel in the middle of the vineyard high on the Hermitage hill belongs to Jaboulet. We will drive up the Hermitage hill to get a close up look at the famous “La Chapelle”. In 2006 the Frey family, owners of Château La Lagune in the Médoc, acquired Paul Jaboulet Aîné. 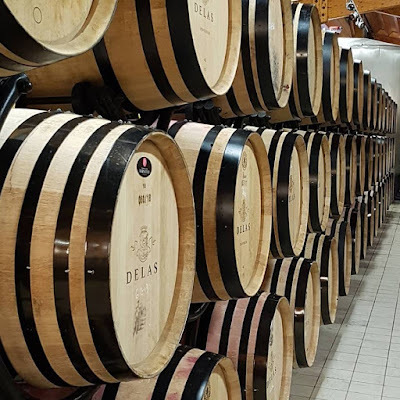 Since then the Freys have started a forceful expansion, increasing the domaine vineyard sites to almost 300 acres with purchases in the Northern Rhône as well as in Châteauneuf du Pape. 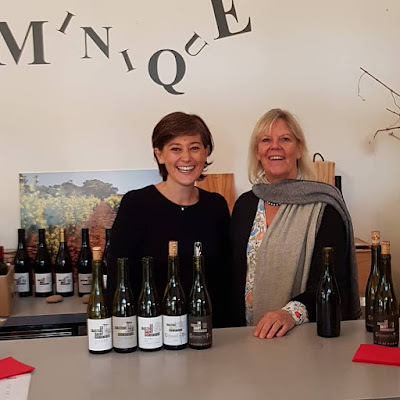 Winemaker Caroline Frey also started converting the domaine vineyards to biodynamic principles and encouraged the growers they buy grapes from to convert to organic or sustainable vineyard management. Jaboulet wines belong once again to the best of the Rhône Valley wines. 06.45 pm Check-in at Hôtel Le Pavillion de l’Hermitage in Tain-l’Hermitage. 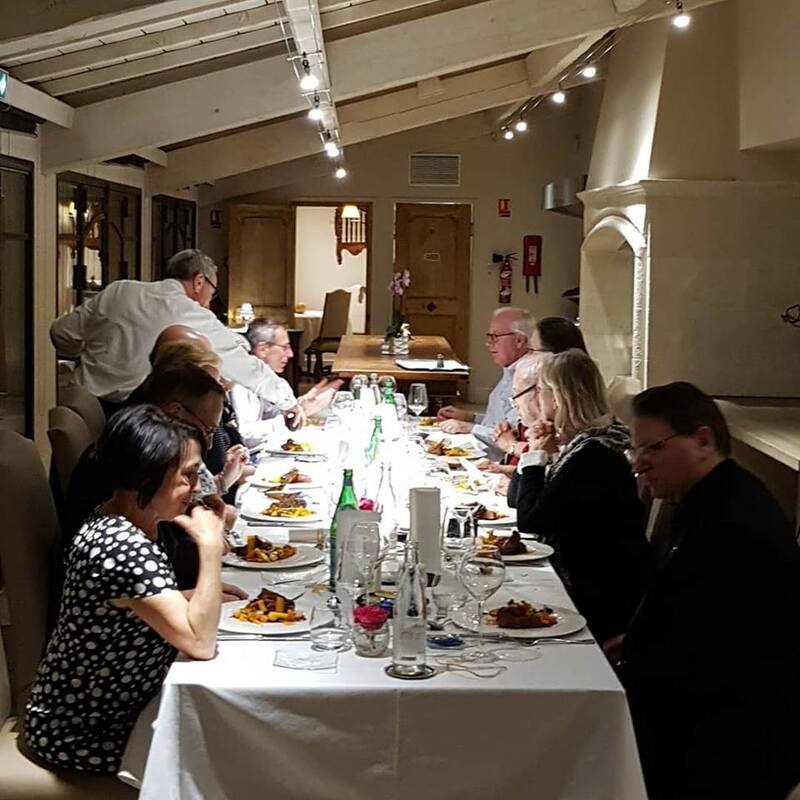 Hôtel Le Pavillion in Tain-Hermitage is a 3 star hotel belonging to Maison Chaputier situated in the center of town at the foot of the famous Hermitage vineyards and in walking distance to the Rhône river. It is being renovated and should soon be upgraded to a 4 star hotel. Evening and dinner was on our own. Some of us stroll along the banks of the Rhône river and crossed the bridge to walk to Tournon-sur-Rhône on the other side of the Rhône. From there you had a fantastic view of the hills with the Hermitage and Crozes Hermitage vineyards. Annette and I finished the evening in a wine bar. 09.00 am Cellar tasting at Domaine Laurent Habrard in Gervans, Crozes-Hermitage, Northern Rhône. Owner and Winemaker Laurent Habrad was our host. 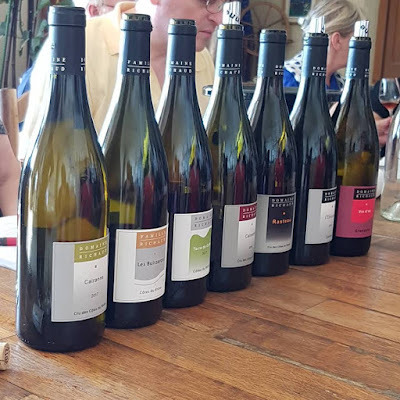 Current owner, manger, and winemaker of this 45 acres domaine is Laurent Habrard, 5th generation of the Habrard family who has been building up the winery in Gervans at the foot of the Crozes-Hermitage hill. In 2008 Laurent started to convert to organic viticulture. Since 2011 the estate is certified organic and since 2013 the domaine no longer uses SO2 during vinification. None of his wines see new wood, as he has been transitioning away from old barrels to concrete tanks. 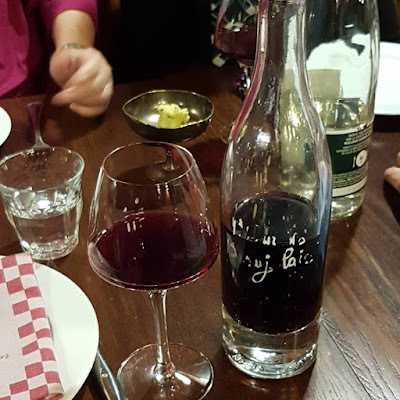 The Crôzes-Hermitage Rouge is made from 100% Syrah from vines grown in the vineyard ‘Les Chassis’ in the commune of Pont de l'Isère and also the communes of Gervans and Erôme. Laurent's vines are old, the Syrah averages 40-60 years of age. In general all Domaine Habrard vineyards are mature with an average of over 40 year old vines. 10.45 am Cellar tour and tasting at Domaine Combier in Pont de l’Isère, Crozes-Hermitage, Northern Rhône. Owner/ Winemaker Laurent Combier was our host. Maurice Combier came to Pont de l’Isère in 1962 to grow apricots, other fruit, and grapes. In the 70s he converted to organic agriculture and people labeled him ‘Maurice Le Fou’ (Crazy Maurice). He sold his grapes to the cooperative. In 1989 his son Laurent joined the domaine. He became interested in winemaking, studied oenology, and moved the domaine into viticulture. He built a cave and started to produce wine. Today the domaine has 75 acres with most of the vineyards situated around Pont de l’Isère in the AOP Crozes-Hermitage and some smaller plots across the river in Saint Joseph. Their top wine ‘Crozes-Hermitage- Les Grives’ comes from the 1952 plot of the Clos des Grives: ten hectares of almost perfect Syrah. The white in this plot is 95% Roussanne. 01.00 pm Lunch at La Grand Table de Michel Chabran, 1 star Michelin, in Pont d l’Isère. We had lunch at La Grand Table de Michel Chabran and took the tea in the beautiful garden. 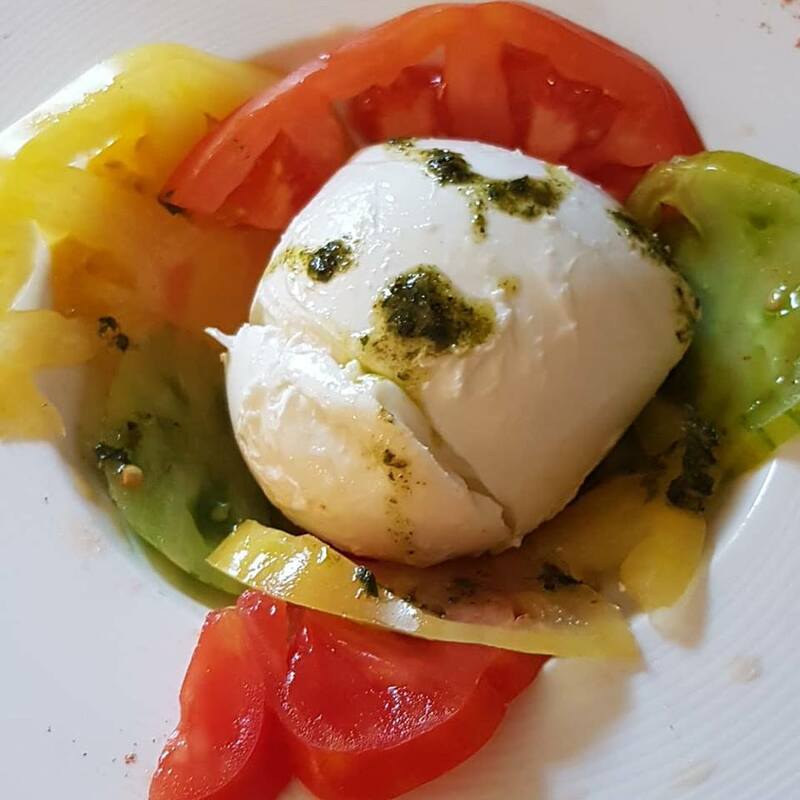 Chef Michel Chabran joined us there and talked with us about his philosophy of cooking. 04.00 pm Vineyard tour, cellar tour and tasting at Domaine Les Bruyères in Beaumont-Monteux, Northern Rhône. Owner/ winemaker David Reynaud was our host. 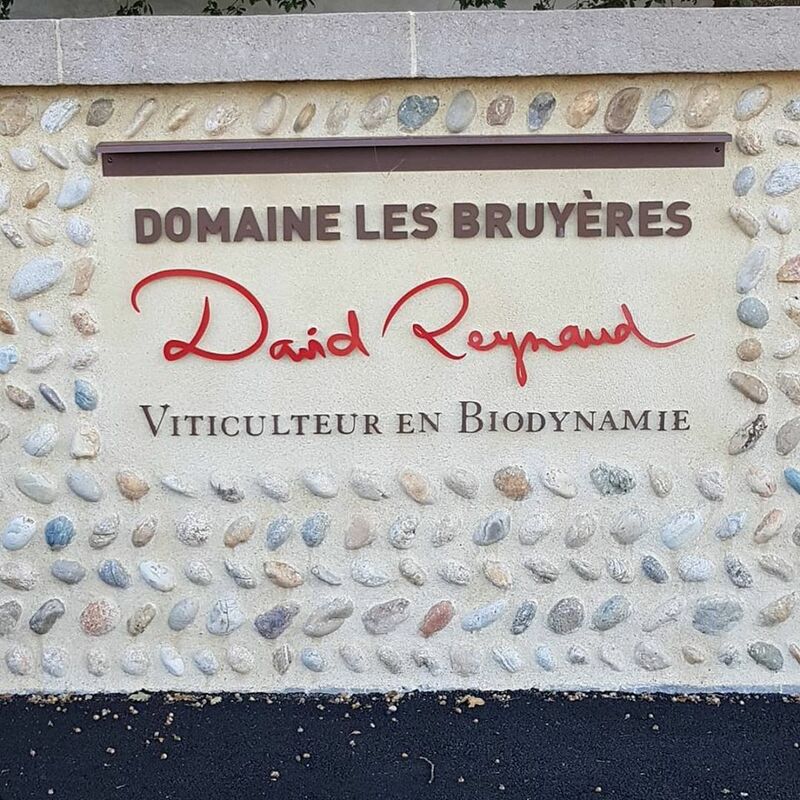 Domaine Les Bruyères has been in the Reynaud family since the 18th century. In 1955, Georges Reynaud planted vines on a gentle slope along the Isère River –a Rhône tributary - in the southern sector of the Crozes-Hermitage appellation. The grapes were sold to the cooperative. In 2003 George’s grandson David took over. He constructed modern wine making facilities, and produced his first vintage. He also bought new vineyards bringing the domaine up to 50 acres under vine. Before his ownership in 2003 David already controlled the domaine and had started to farm organically, so the domaine was certified by Ecocert the same year as his first harvest. 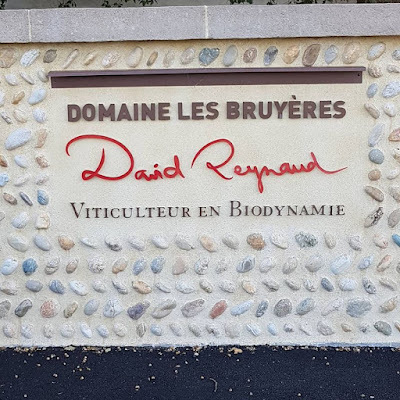 He then converted slowly to biodynamic principles and Domaine Les Bruyères received its Biodyvin certification in 2005. 05.30 pm Departure. We left the Northern Rhône and drove to the Southern Rhône. 07.30 pm Check-in at Hôtel Domaine de Cabasse in Séguret, Southern Rhône. Hôtel Domaine de Cabasse in Séguret is a 3 star hotel with pool and a very good restaurant in a wine domaine surrounded by vineyards. The view up to the village of Séguret perched on the hill is breathtakingly beautiful. 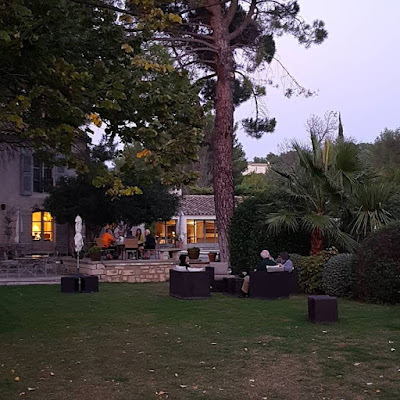 We enjoyed the tranquility and beauty of this Provencal wine domaine which sits in the mids of vineyards, and soaked in the stunning views towards the village of Séguret perched to the mountain in the distance, before having dinner. 08.45 am Departure. We drove around the Dentelles de Montmirail to the other side of the mountains. 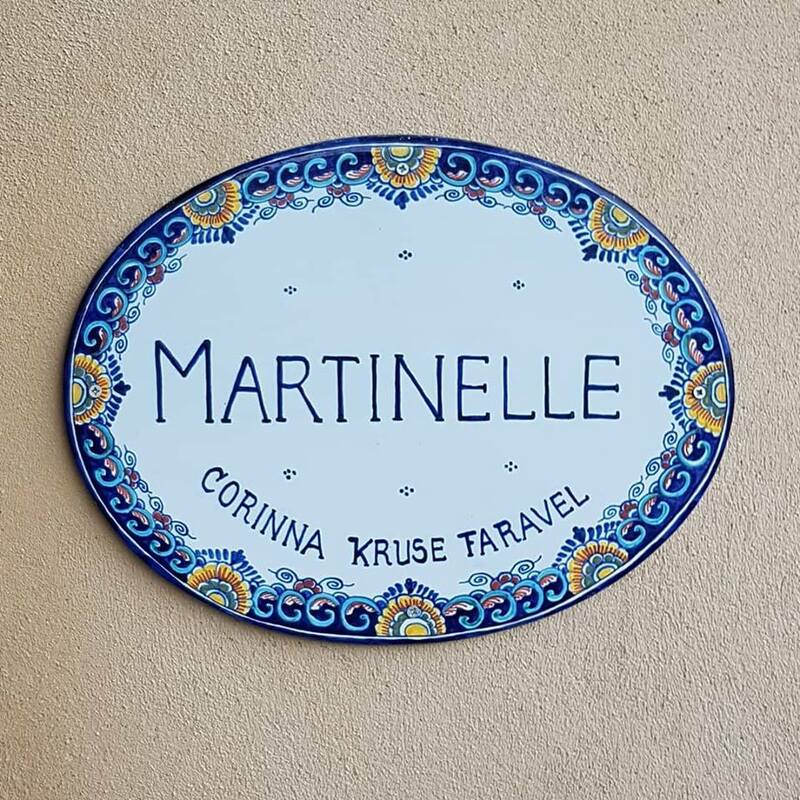 09.15 am Cellar tour and tasting at Domaine La Martinelle in Lafare, Ventoux, Southern Rhône. Owner/ Winemaker Corinna Kruse Faravel was our host. This domaine is located on the other side of the Dentelle from Gigondas and Vacqueras. was founded in 2001 by Corinna Faravel. Today the estate has 75 acres of vineyard holdings. Corinna has been making white wine in Germany’s Nahe region, but was always interested in making red wine, so she came to the Rhône Valley. Love made her stay (she is married to Thierry Faravel of Domaine La Bouissière) and in 2001 she founded Domaine La Martinelle. Ths domaine has 75 acres of vineyard holdings on a series of small, terraced hillsides that run from 810 to 900 feet in altitude. 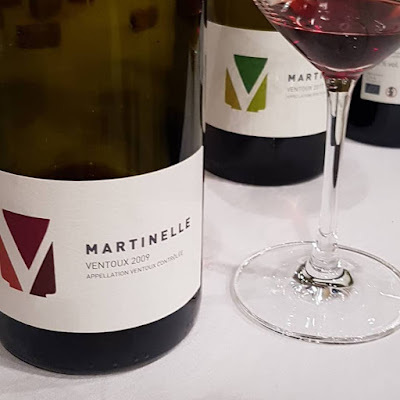 Soils are a mix of limestone (like Burgundy, thus finesse), clay (contributes body and volume) and gypsum (good for soil fertilization; probably a result of volcanic activity from the Ventoux). While much of the Ventoux is located on alluvial lowlands, this mountainous eastern corner is widely held as the highest-quality growing area of the entire appellation. The regional ‘mistral,’ or cold northern winds from the Alps, rushes through these valleys in the summer months, keeping temperatures cool. The vineyards’ altitude works to extend the growing season, with harvest often in late September through early October. 11.15 am Arrival in the village of Séguret. Séguret literally hugs the hillside topped by the ruins of its feudal château. Séguret is one of the official "most beautiful villages in France", and thoroughly deserves this distinction. You cannot withstand the charm of this medieval atmosphere and the historical treasures of this village. We had time to wander around. To spend some time in one of the typical Provencial villages is a must, just to get a feel for the region. 12.00 pm Lunch at restaurant Le Mesclun in Séguret. We enjoyed the gorgeous view from the restaurant’s terrace to the vineyard covered valley below and the fabolous lunch. 02.00 pm Cellar tour and tasting, including from barrel, at Domaine Marcel Richaud in Cairanne, Southern Rhône. Claire Richaud was our host. 04.15 pm Back at Hôtel Domaine de Cabasse. 05.00pm Tasting at Domaine de Cabasse, Séguret, Southern Rhône. Owner/ Winemaker Benoit Baudry was our host. Domaine de Cabasse was founded in the 1950s. 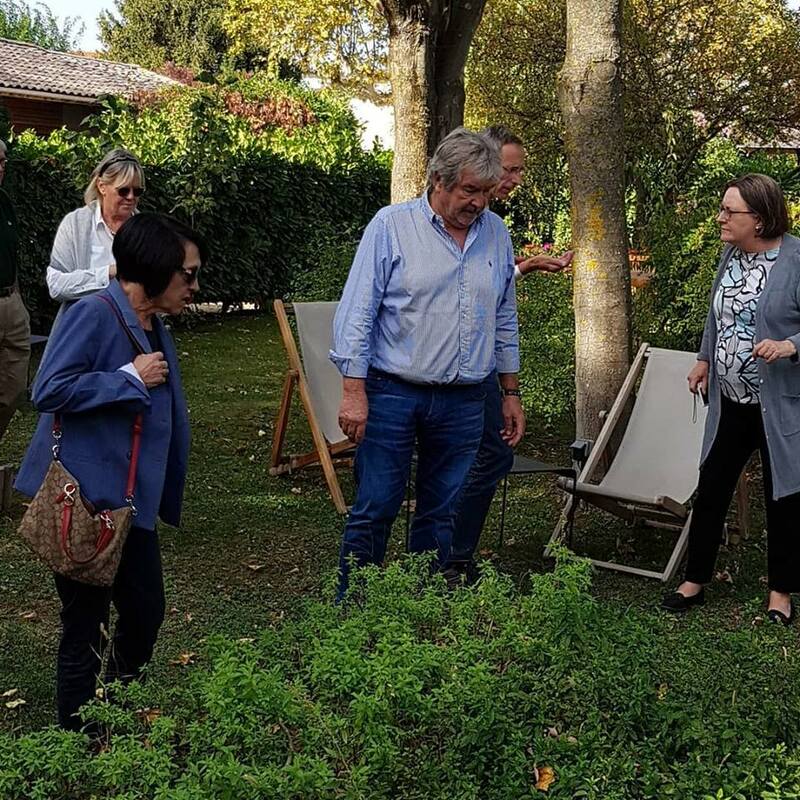 In 1991 a Swiss couple bought the domaine, then in 2012 Anne and Benoit Baudry from the Loire valley acquired the estate and opened the hotel. The 30 acres of vineyards are located around the domaine with 12 acres in the Côtes du Rhône Villages Sablet, 17.5 acres in the Côtes du Rhône Villages Séguret, and 7.5 acres in the Cru Gigondas appellation. The vines grow on an exceptional terroir. 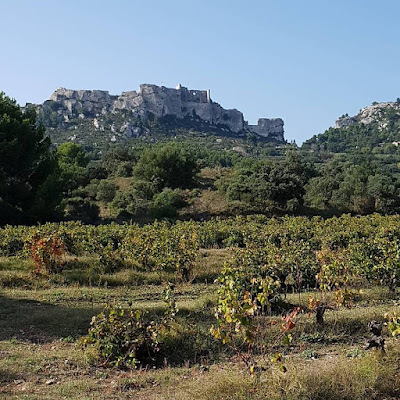 Located at the foot of the Dentelles de Montmirail, the soils derived from calcareous rocks decomposed with varying proportions of pebbles giving the grapevine only what it needs for perfect growth. The south-west facing slopes guarantee optimal sun exposure and ripeness. 10.00 am Tasting at Rhonéa Vignoble, a Copérative in Vacqueyras. 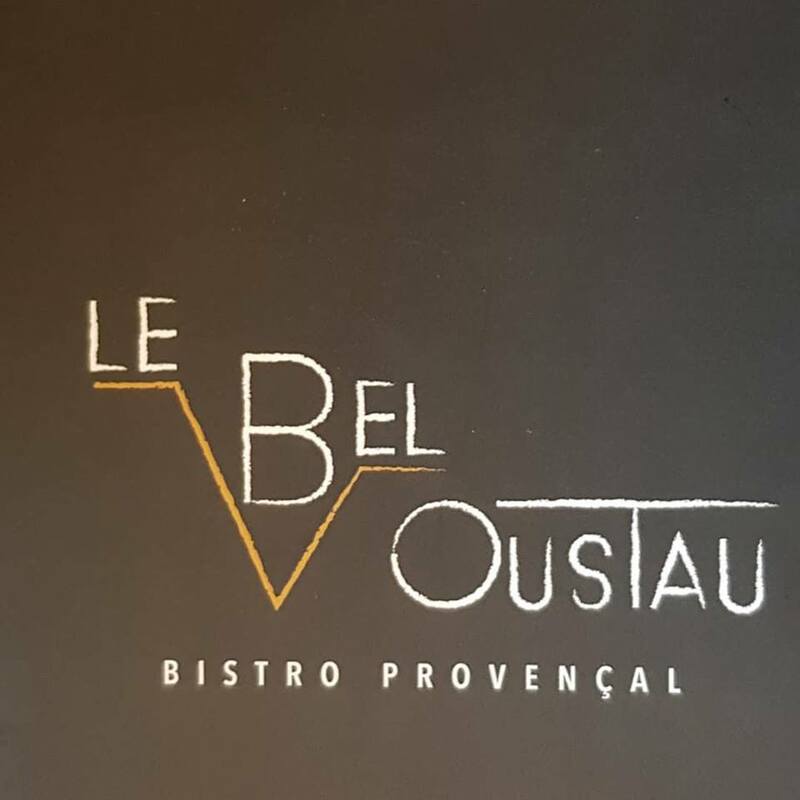 12.00 pm Lunch at restaurant Le Dolium in Beaumes-de Venise. Le Dolium is kind of an odd place. 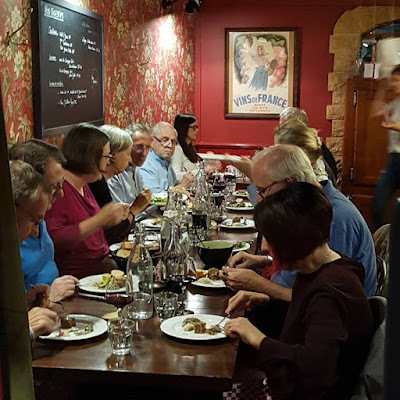 It is part of the local wine producers co-operative but the food is exceptionally good -full of Mediterranean influence and Provencal fragrances. 02.00 pm Departure and drive to Les Baux de Provence. 03.30 pm Vineyard tour, cellar tour and tasting of wine and olive oil at Mas Saint Berthe, Les Baux de Provence. Wiemaker Christian Nief was our host. As early as the 17th centuries farms dotted the country side here. In 1950 the David family acquired the fruit farm Mas Saint Berthe. (“Mas” is the provençal word for “Domaine”). The Davids had a passion for wine and decided to gradually replace apricot tress with vines. In 1976 the construction of the cellars was terminated and they produced their first wine. 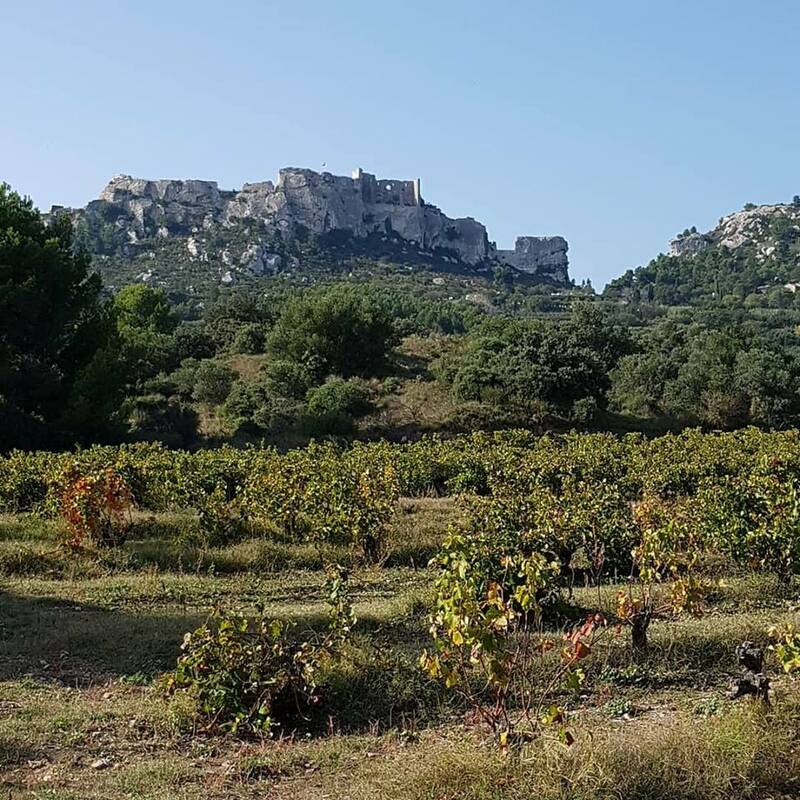 Today Mas Saint Berthe has 100 acres of vineyards at the foot of the Baux rock formation which is part of the Alpilles mountain range in the heart of the Baux AOP. The red grape varieties are: Grenache, Syrah, Cabernet Sauvignon, Mourvèdre, Cinsault, Carignan. There are five white grape varieties: Grenache blanc, Rolle, Sauvignon, Ugni blanc, Roussane. The portfolio comprises wines of the AOP Les Baux de Provence appellation and two I.G.P. Alpilles. There also is an olive grove of 6 acres with 4 local varieties: Grossane, Salonenque, Verdale for the production of Baux valley olive oil and Tapenade and Green Picholine olives. 06.00 pm Check in at Hôtel Benvengudo in Les Baux de Provence. Hôtel Benvengudo in Les Baux is a 4 star luxury traditional Provencal country house style hotel with a good sized pool and a superb restaurant located on seven acres of private gardens. From every window, you can see the private gardens, lavender field and olive groves. 08.00 pm Dinner at restaurant Benvengudo. 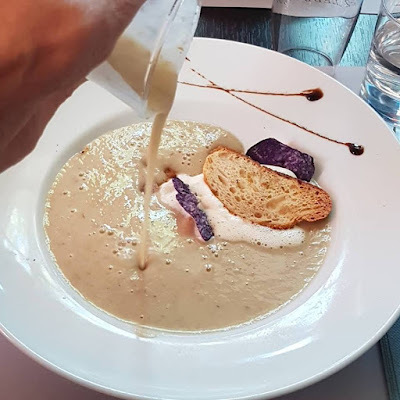 We had a three course superb dinner prepared by chef Thomas Voisin. 10.00 am Arrival in Arles. An English speaking guide gave us a excellent tour. 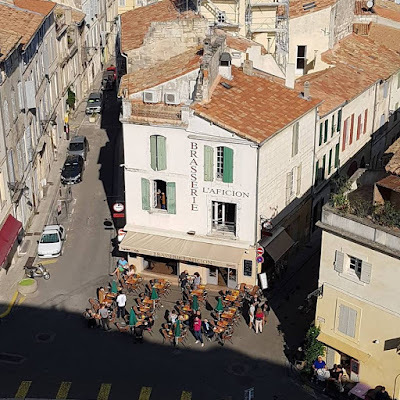 When visiting the Southern Rhône a sightseeing tour to Arles is a ‘must’. Arles exists since the 800 BC but it became an important city much later when it came under Roman influence in 123 BC. During the Late Roman Empire Arles was the cultural and religious center and the city reached its peak of influence during the 4th and 5th centuries, when Roman Emperors frequently used it as their headquarters during military campaigns. Arles is also knows as the city of Van Gogh. It was here where he produced some of his most famous paintings. 01.30 am Lunch at restaurant Le Bel Ousteau in Fontvieille. 04.00 pm At Hôtel Cloître Saint Louis in Avignon. Hôtel Cloître Saint Louis in Avignon is a 4 star unique hotel that is thoughtfully preserved and a timeless place in the heart of Avignon. The Cloître Saint Louis was originally a Jesuit seminary and reeks of history. The cloisters with soaring, vaulted ceilings house the restaurant and bar. The inner courtyard shaded by old plane trees boasts of a good sized pool. 05.00 pm We walked to the Palace of the Popes. 05.30 pm Guided tour of the Palace of the Popes. To pay a visit to the Palace of the Popes is the second ‘must” when travelling in the Southern Rhône region. The palace is one of the largest and most important medieval Gothic buildings in Europe. 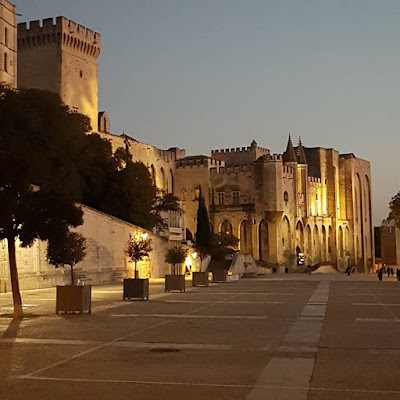 It is also of great importance for European and Christian history given the fact that between 1309 and 1377 the Roman Catholic Papacy resided in Avignon and the Popes took residence in the ‘Palace of the Popes’. 07.00 pm The evening was free to explore the charming city of Avignon. 10.15 am Cellar tour and tasting at Domaine du Pegau in Châteauneuf du Pape. Owner/ Winemaker Laurence Féraud was our host. We also met cellar master Andreas Lenzenwöger. There is evidence that the Féraud family cultivated vines as early as 1733. However Domaine Pegau only came into existence in 1987 when Paul Féraud and his daughter Laurence created the estate with initially 17,5 acres of vineyard holdings. Today the domaine has a total of 51 acres in the Châteauneuf du Pape appellation with a small percentage (about 4 acres) of white grapes; 67 acres of the Côte du Rhône Village appellation, 5 acres of Côte de Rhône, and 53 acres VSIG (vins sans identité géographique – vin de France). 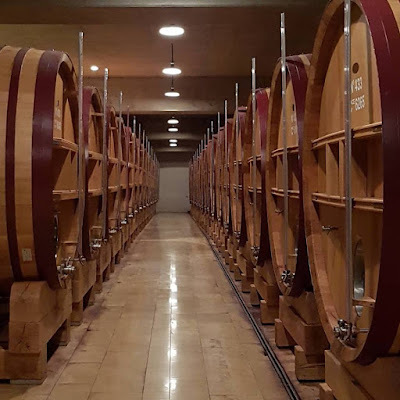 Pegau produces two special Châteauneuf du Pape red cuvées: one is the ‘Cuvée da Capo’ made most years and coming from a plot in La Crau. The lieu dit ‘La Crau’ is a very special plot in the Châteauneuf du Pape vineyard sites and the most famous one. It is the area towards Courthézon and particularily rich in the galets roulés, round rocks or pebbles covering the clay soil, and perfect for retaining the heat. 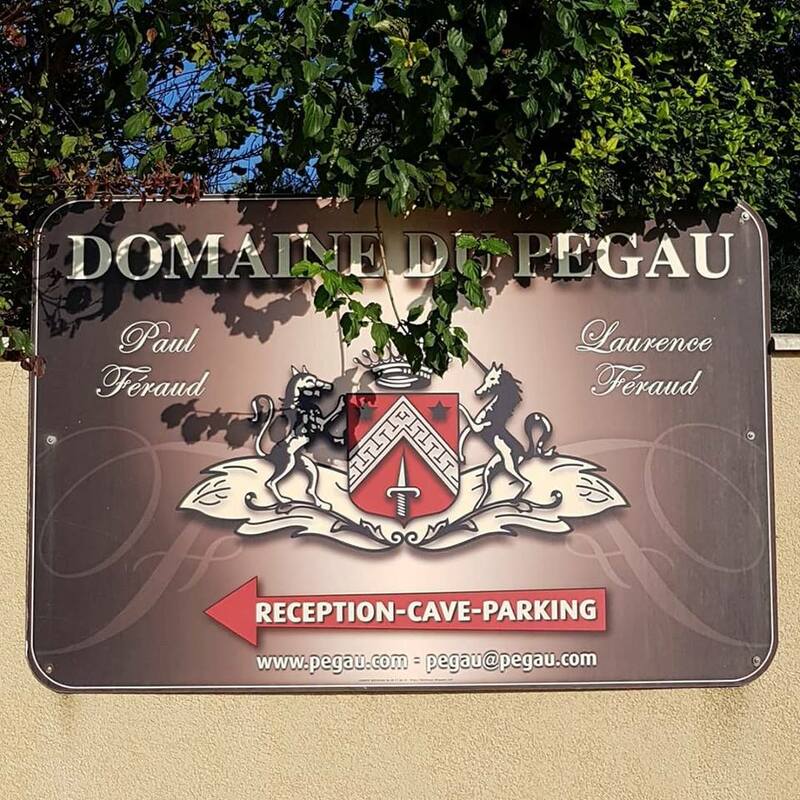 Domaine Pegau is one of the top Châteauneuf du Pape producers and always among the top 3 in France’s Revue du Vin, Wine Advocate and other important magazines. 12.30 pm At Pont du Gard. 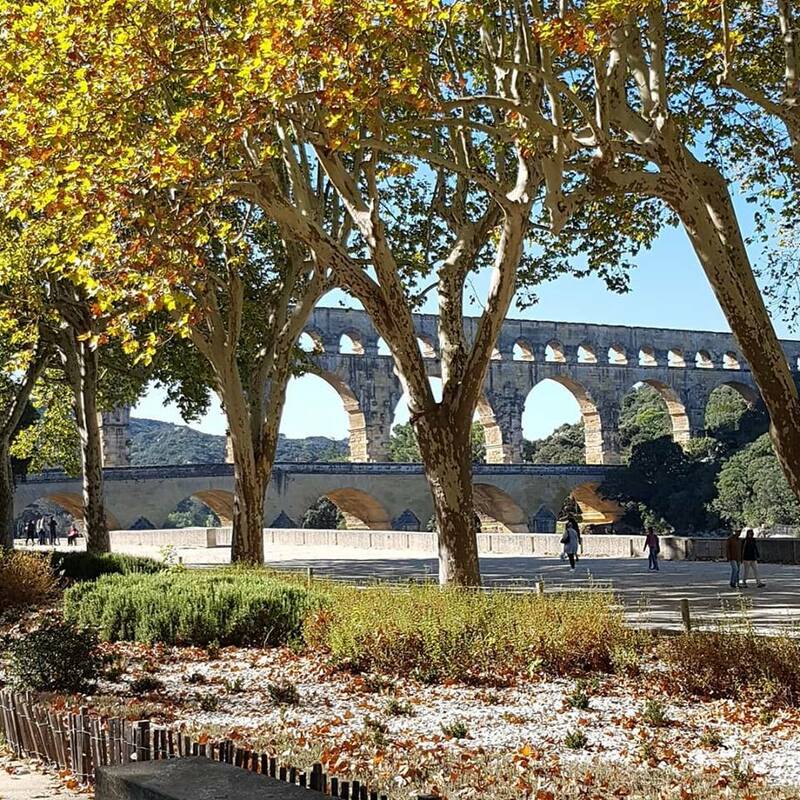 A visit to the Pont du Gard is the third ‘must’ in the Southern Rhône region. The Pont du Gard is a Roman aqueduct bridge built in the first century AD that was part of a sophisticated system bringing water to the Roman colony of Nîmes. It is a UNESCO World Heritage Site and truly fascinating. 01.00 pm Lunch at restaurant Les Terrasses at Pont du Gard. 03.45 pm Cellar tour and tasting at Domaine de la Mordorée, Tavel, Southern Rhône. Owner Ambre Delorme was our host. This domaine came into being in 1986 and the first wine was produced by Christoph Delorme in 1987. Up until that time the estate had been little more than a hobby for his father Francis Delorme, an industrialist with two great passions; shooting and wine. Christoph’s brother Fabrice joined the business in 1999 and it did not take them long to project this estate into the Premier League. Domaine de la Mordorée is one of the more widely dispersed domains in the Southern Rhône. Their 100 acres of vineyards are in Tavel (16 acres), in Lirac (36.5 acres of top notch plots), 40 acres generic Côte du Rhône, and 7,5 acres in Châteauneuf du Pape. The wines are dvided in two lines in most appellations, the introductory cuvée ‘La Dame Rousse’, and the top cuvée ‘La Reine des Bois’. In some very good vintages they also produce a super cuvée –only in Châteauneuf du Pape- ‘La Plume du Peintre’ from 100 year old Grenache vines. 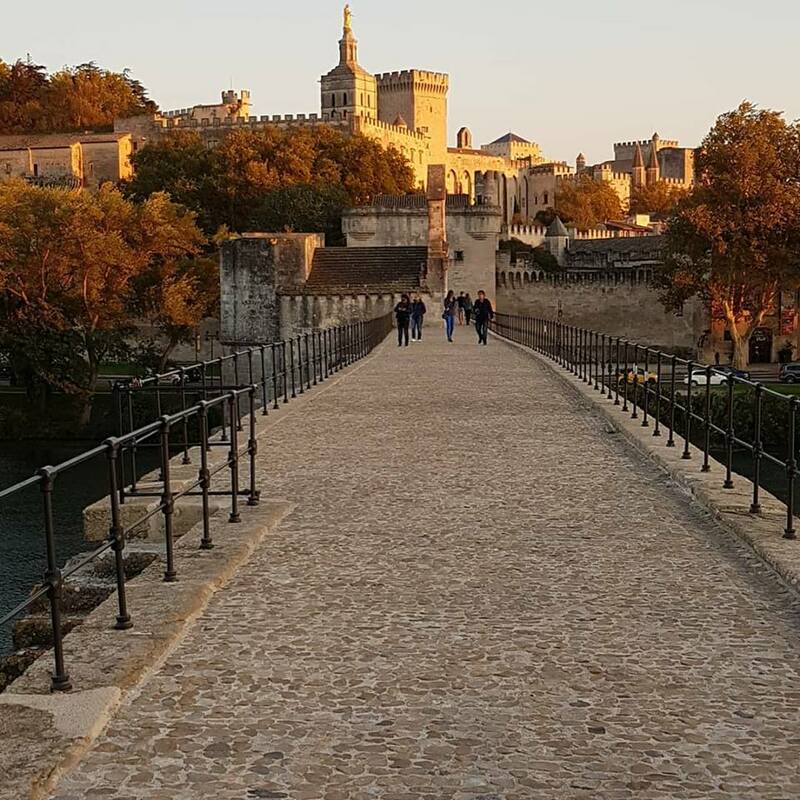 06.00 pm Guided tour of Pont Saint-Bénézet in Avignon. 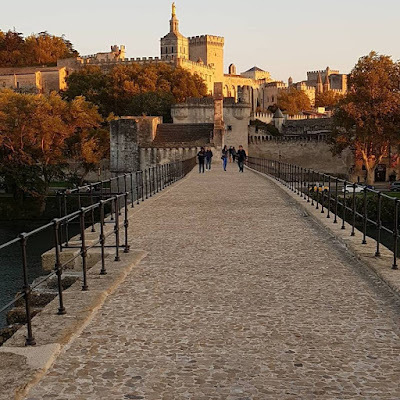 This is the famous ruin of the so-called ‘Pont d’Avignon’, a bridge across the Rhône river built between 1177 and 1185. 09.45 Cellar tour and tasting at Domaine La Bastide Saint Dominique in Courthézon, Châteauneuf du Pape. Owner Véronique Bonnet was our host. We briefly met her brother/ owner/ winemaker Eric Bonnet. 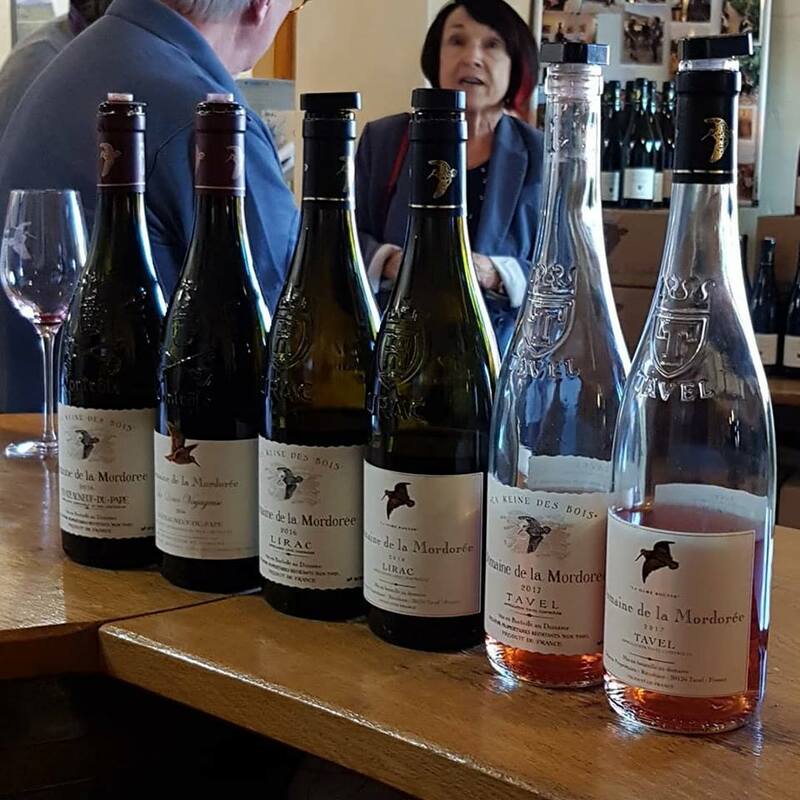 The Bonnet family – owners of this estate – has been producing wine since four generations. However they did not bottle the wine but sold it by barrel to a négociant. Eric Bonnet, the fourth generation said: “My family has been making wine for a number of years now. My great-grandfather started it. He did not bottle the wine he made under his own label, but sold it by barrel to a négociant. 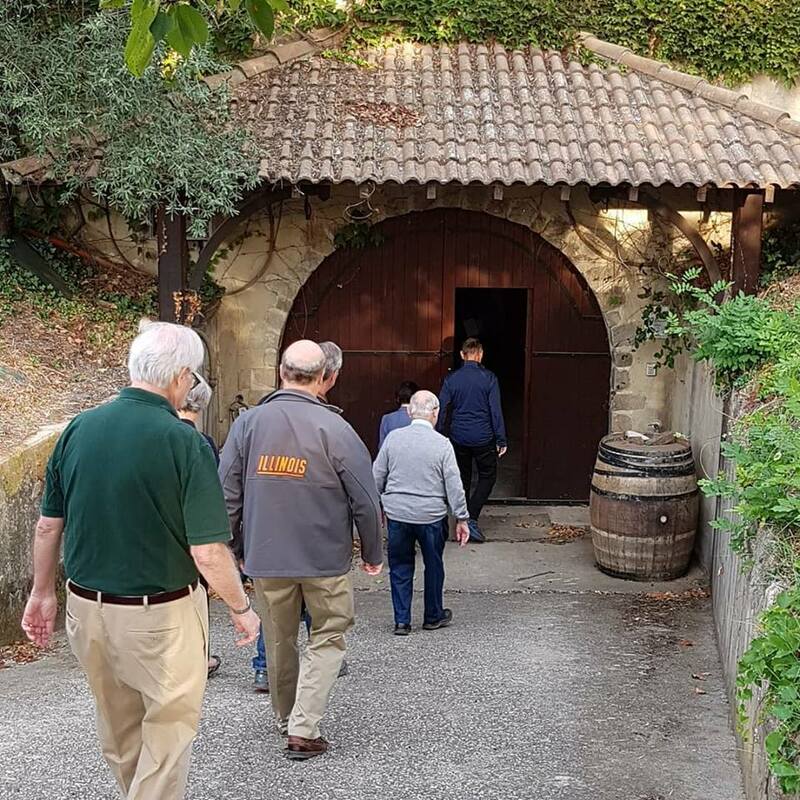 My father started to bottle the wine in 1980.” The current domaine was created by Marie-Claude and Gérard Bonnet with only a handful of hectares. With strong commitment and passion, the Bonnet’s have expanded the estate to a total area of 130 acres, producing Appellations d’Origine Protégée (AOP) Côtes du Rhône, Côtes du Rhône Villages, Cairanne, Châteauneuf du Pape and Indication Géographique Protégée (IGP) Méditerranée. 21 acres are in the Châteauneuf du Pape appellation. The Châteaneuf du Pape vineyards are in 7 different lieux-dits: Chapouin, la Gardiole, Pignan, la Guigasse, les Bédines, Valori and Saint Georges. Eric Bonnet: “Our oldest vines were planted in 1920 in Pignan. 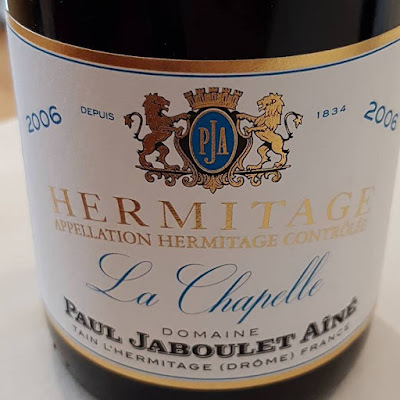 A further area was planted with Grenache after World War II, and in the course of the past 20 years or so, the range of grape varieties was expanded 2 more times: with Syrah in 1989 and with Mourvèdre in 2006.” 4 red Châteauneuf du Pape wines and 1 Châteauneuf du Pape Blanc. 12.00 pm Visit of the ruins of the Summer Palace of the Popes. We drive up to the Pope’s summer palace that gave the village and vineyard appellation its name. Today we can only see the ruins of the medieval castle which sits at the top of the village and dominates the landscape to the south. It was built in 1320. 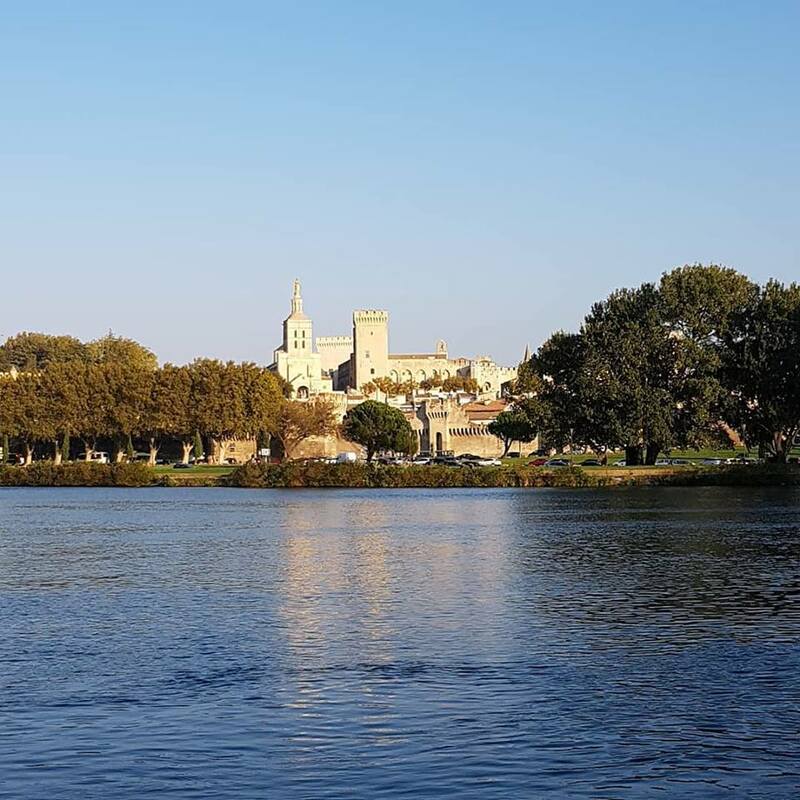 The Popes of Avignon built their summer palace here to get away from busy Avignon. Only two walls and the foundation remain of the château. The walls are facing the village, and you see them from afar. They are still high and imposing, giving a good impression how it must have been centuries ago. 12.30 pm Visit of the Village of Châteauneuf du Pape. 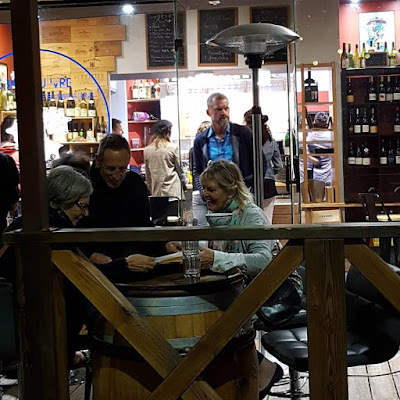 We checked out the small but famous village of Châteaunauf du Pape and had lunch there There are many wine shops ‘caveau’ where you can taste wines that offers tastings. Châteauneuf-du-Pape was the first vineyard in France, in 1924, to have all of its wine protected as an established name. This was the forerunner of the AOC – now AOP classification. 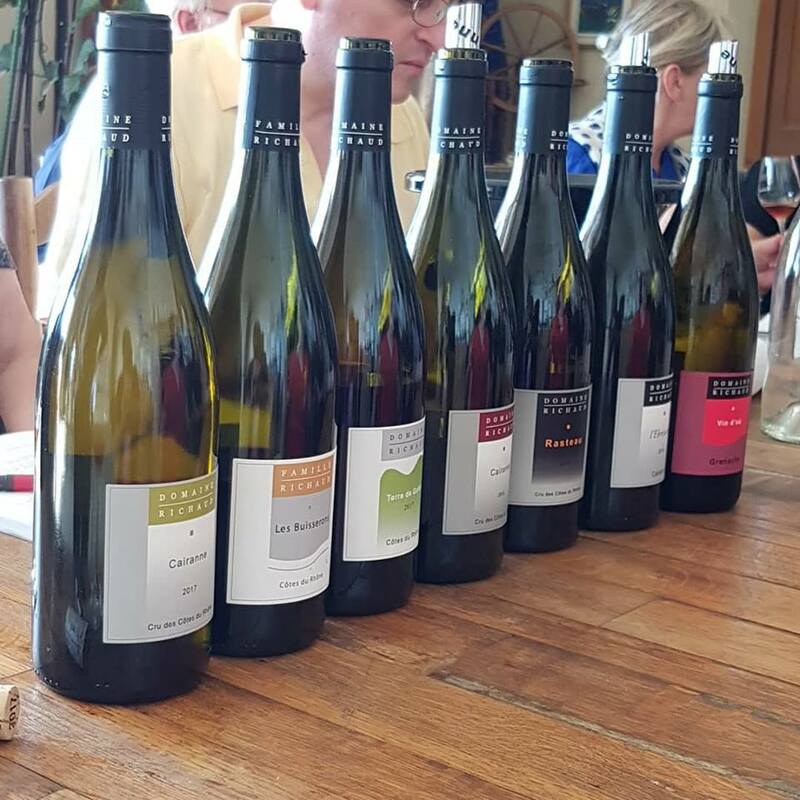 2:00 pm Tasting at the caveau of the Perrin family. Also right in the center of town you find the caveau of the Perrin family, owners of Château de Beaucastel. 03.00 pm Cellar tour and tasting at Château la Nerthe, Châteauneuf du Pape. 04.45 pm Arrival and Check in at Hôstellerie du Château des Fines Roches in Châteauneuf du Pape. Hostellerie du Château des Fines Roches in Châteauneuf du Pape is a 4 star exquisite castle hotel. Approaching the hotel takes your breath away. The medieval and Provencal fantasy style castle was built in the 19th century. It sits high on a hill overlooking the Châteauneuf du Pape vineyards, with gorgeous views to the town of Châteauneuf du Pape and as far as to the Luberon. Hostellerie du Château des Fines Roches was built in the late 1800s by Auguste Constantin. In 1936, Louis Mousset bought the castle including 45 hectares of vineyards and made the property the centre of his extensive wine business and his family home. After the death of Louis Mousset his assets were divided among his three children, Jacques, Guy and Catherine. The château remained in joint ownership of the Mousset family. Today there are three branches of the Mousset family in Châteauneuf-du-Pape who can thank their common grandfather, Louis Mousset, for their status as major landowners and winemakers in Châteauneuf-du-Pape. 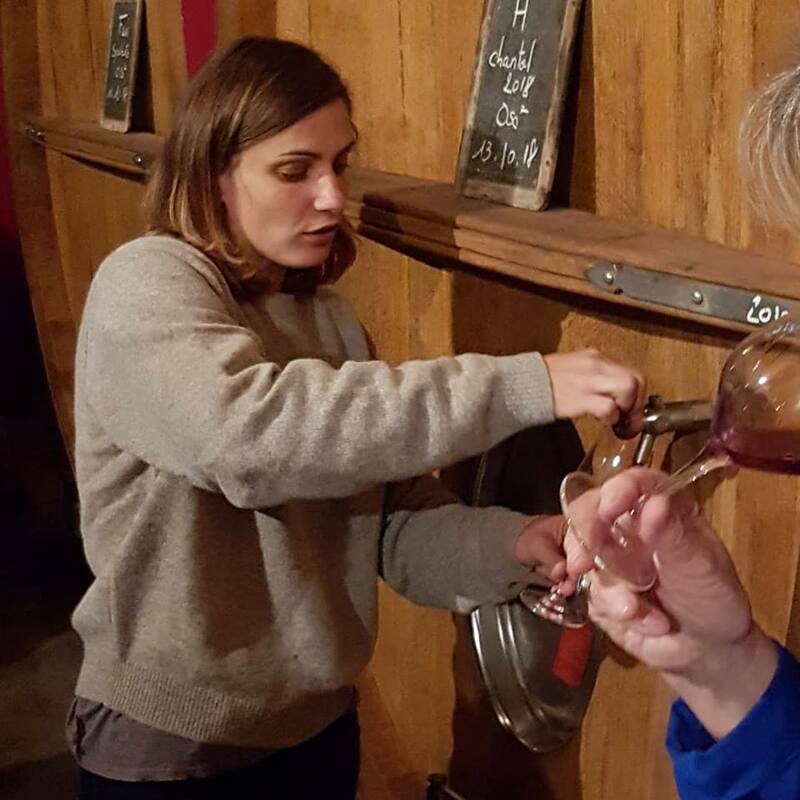 The wine estate Fines Roches is owned by Catherine Mousset-Barrot and its vineyard holdings of 130 acres lie entirely in the Châteauneuf du Pape appellation. 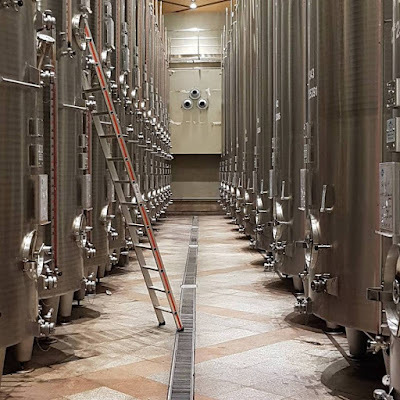 The wines of Clos Saint Michel are made at the cellars of Clos Saint Michel. All other wines of the Mousset family are vinified and aged in the cellars of Château des Fines Roches - separately for each domain. 6:00 pm Aperitif in the middle of the Châteauneuf du Pape vineyards. Some of us took an aperitif in the middle of the Châteauneuf du Pape vineyards before dinner. 07.00 pm Wine-pairing dinner at restaurant Château des Fines Roches. 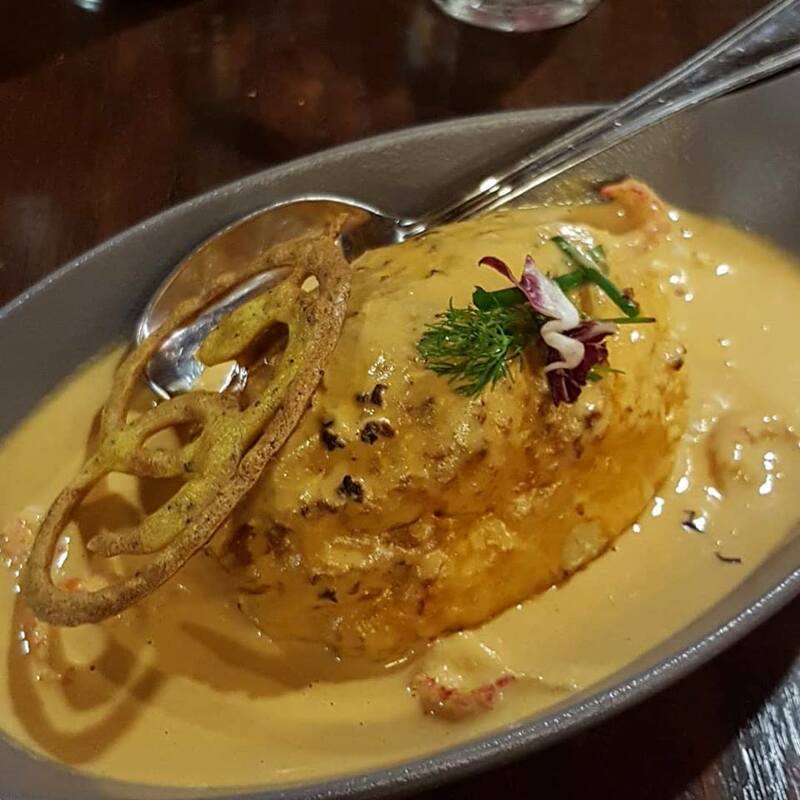 Chef Hugo Loridan-Fombonnet prepared a very special wine-pairing menu for us. Shuttle to Avignon. End of the tour.